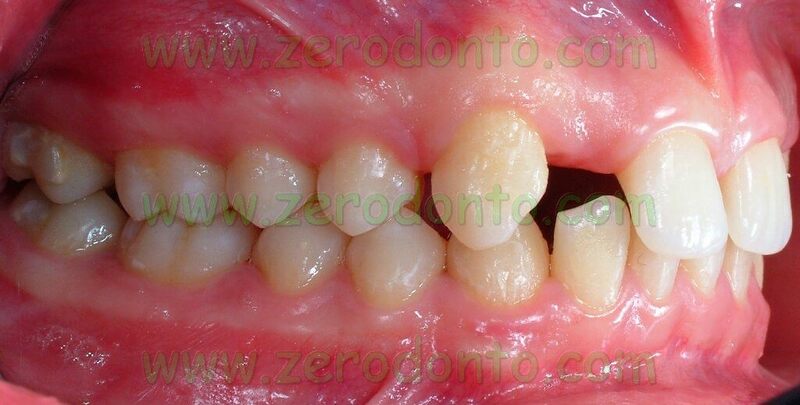 The prevalence of both unilateral and bilateral agenesis of the maxillary lateral incisors is remarkable in dentistry (1). 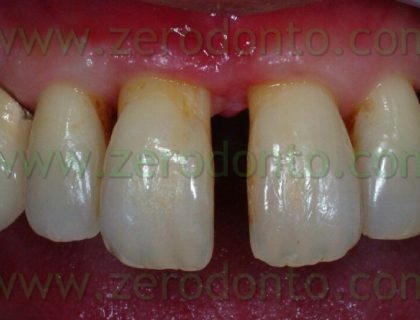 The proper treatment of such a condition requires a multidisciplinary approach and the use of a diagnostic wax up is paramount. 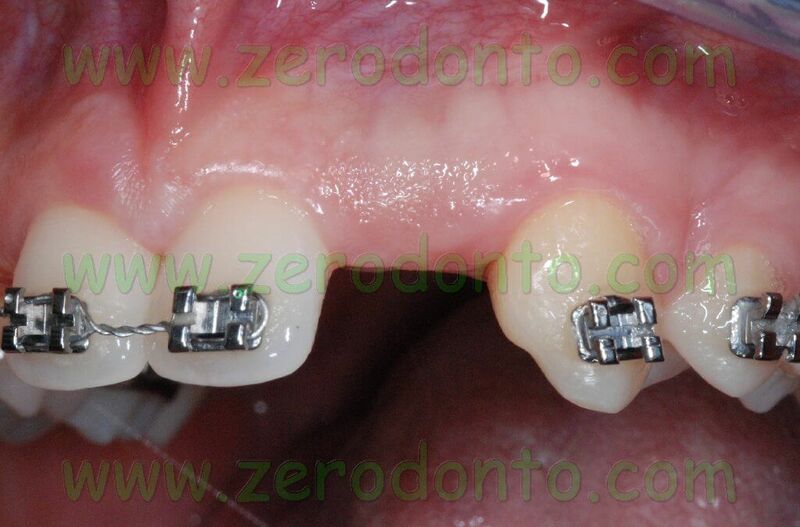 The first step of the rehabilitation consists of a pre-surgical orthodontic treatment to harmonically distribute and balance the interdental spaces (2,3). 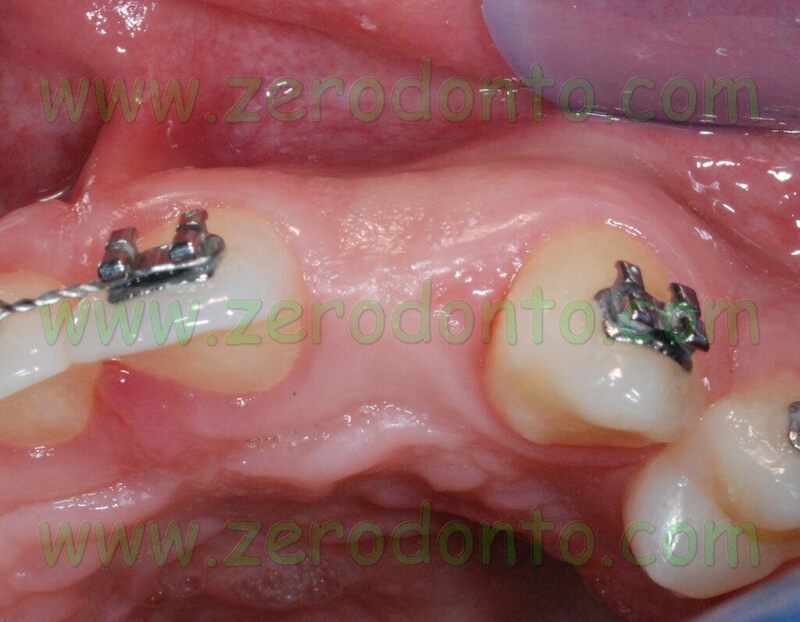 The placement of osseointegrated implants is a complex procedure and attention must be paid to any possible esthetic and functional concern. 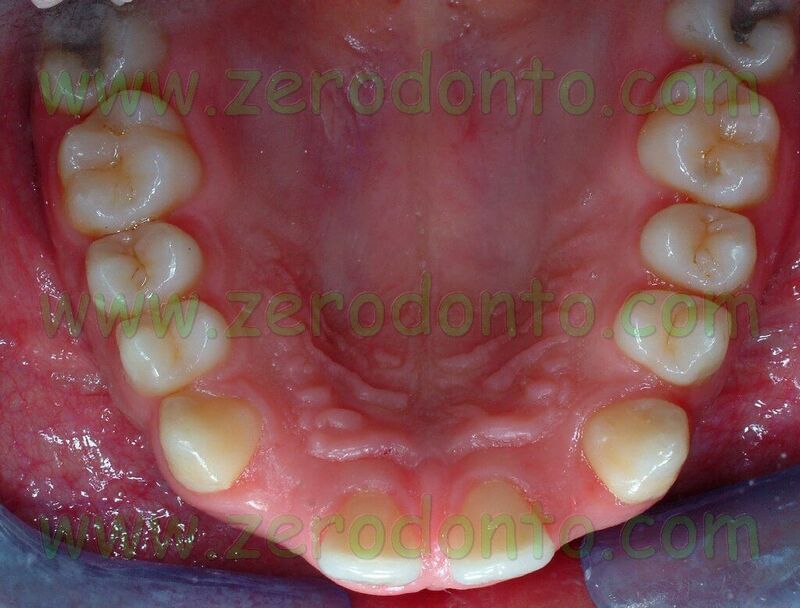 In case of lateral incisors agenesis, a lack of bone tissue is always present due both to the failed development of the missing tooth and to the bone resorption caused by the absence of such tooth. 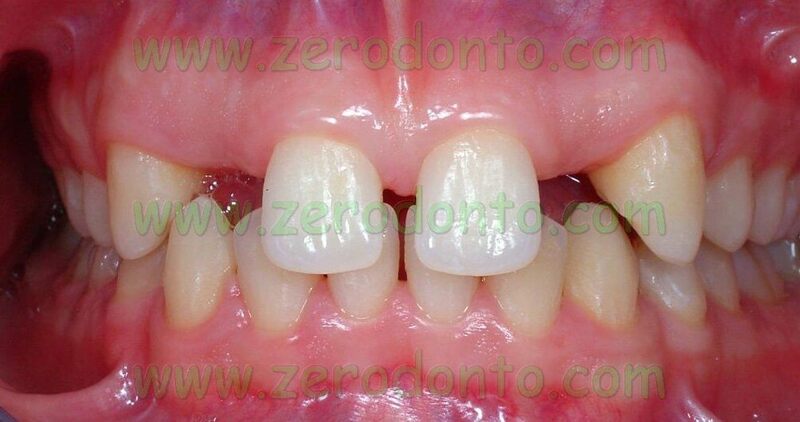 Moreover, a lack of attached gingiva is often evident in the area interested by the agenesis as well. 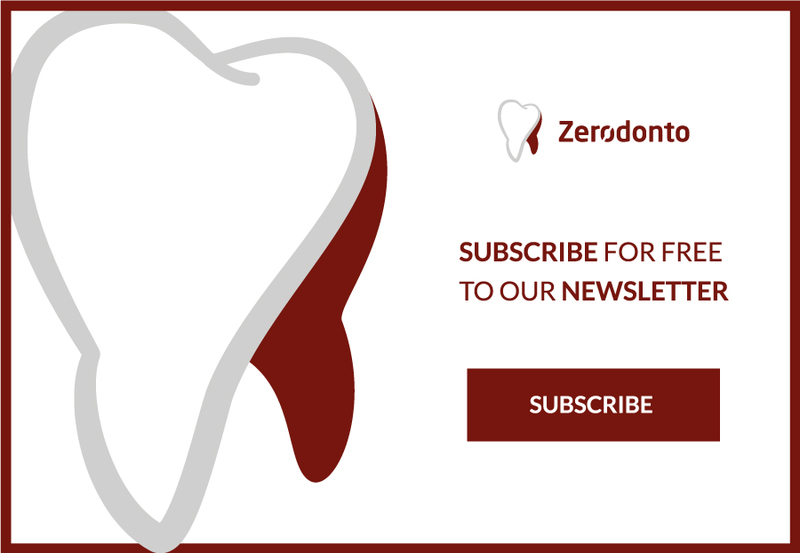 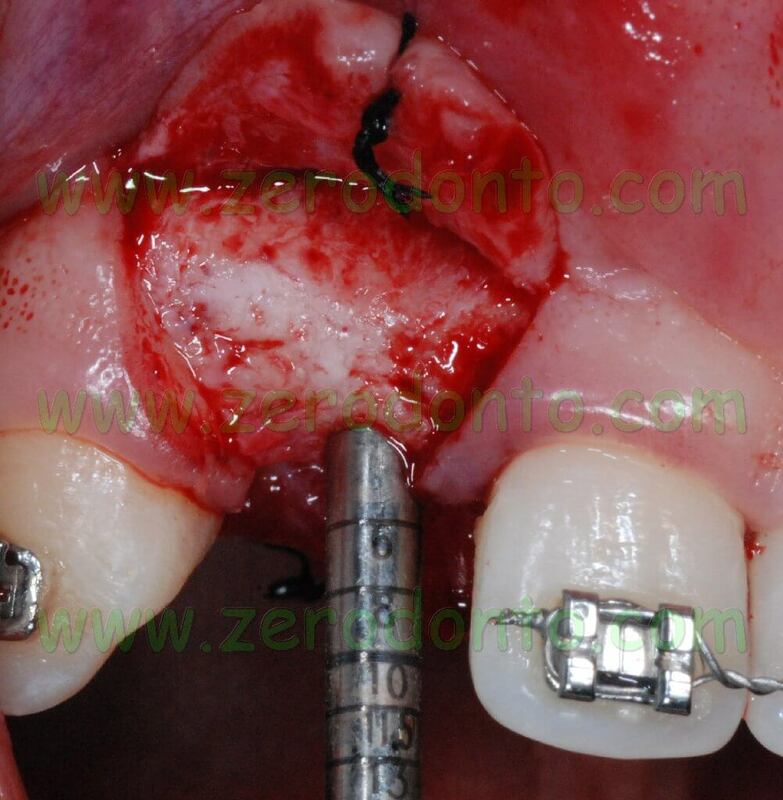 Consequently, in most cases, when an implant treatment is planned, bone regeneration techniques and grafts of connective tissue are necessary to optimize the esthetic outcome. 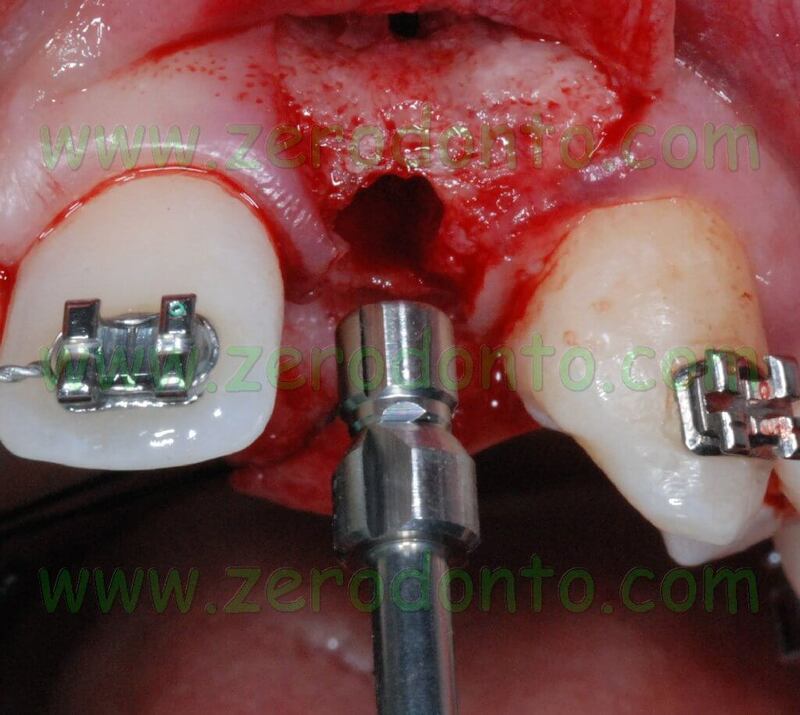 Considering the reduced dimension of maxillary lateral incisors, the choice of the implant type is paramount as well. 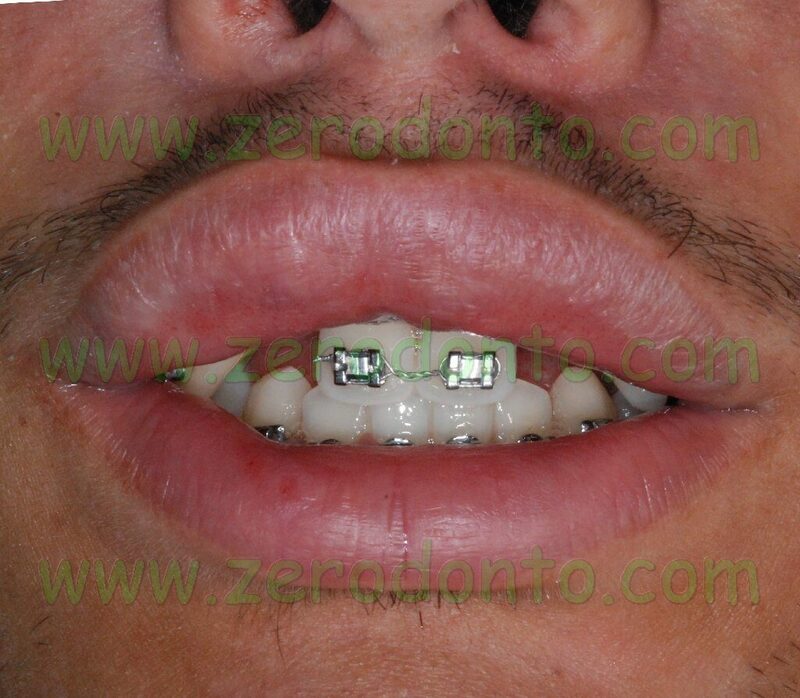 The present clinical report aims at describing the case of a 23-year-old male patient showing a bilateral agenesis of the maxillary lateral incisor and microdontia of the maxillary central incisors. 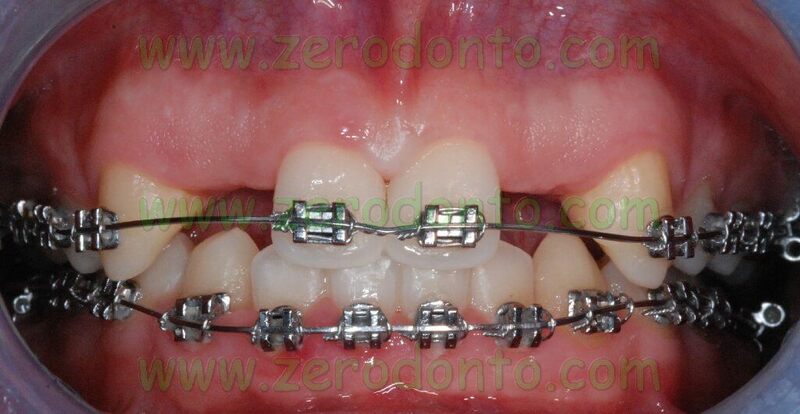 The orthodontic clinical examination showed molar and canine Class I on the right side, molar Class I and head-to-head canine on the left side, deep bite and an increased interincisive angle. 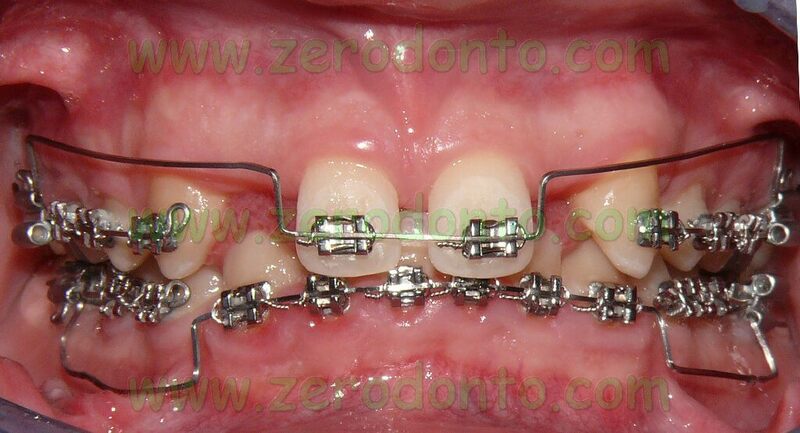 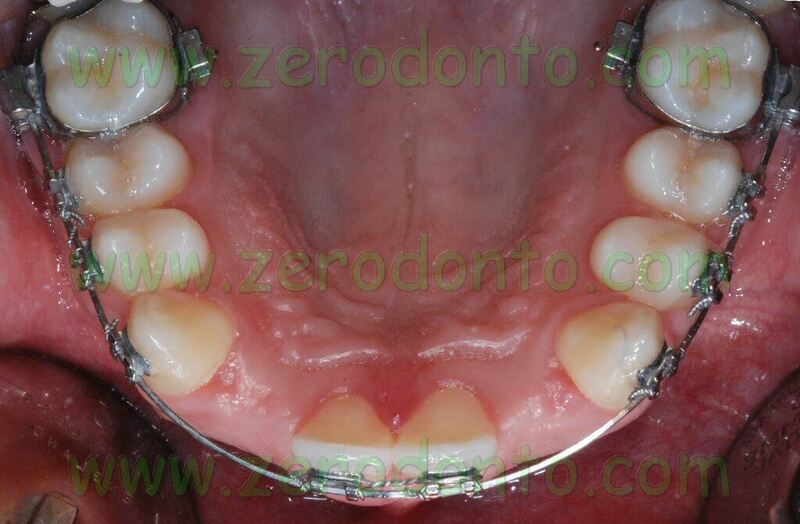 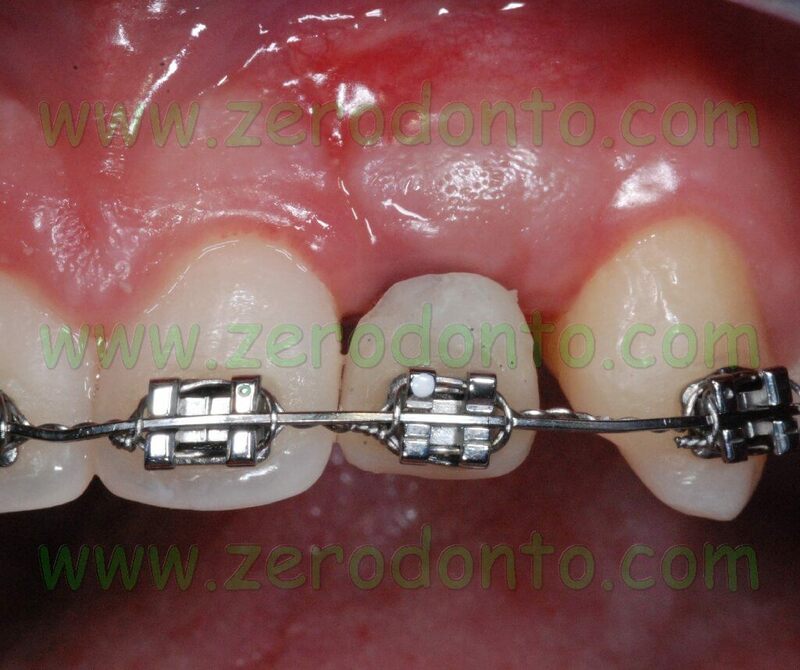 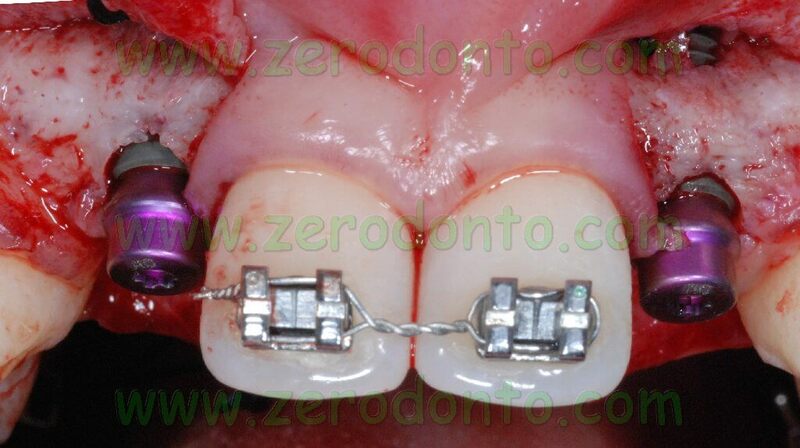 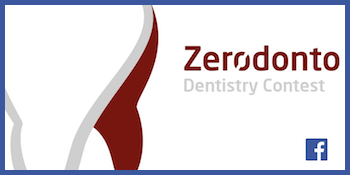 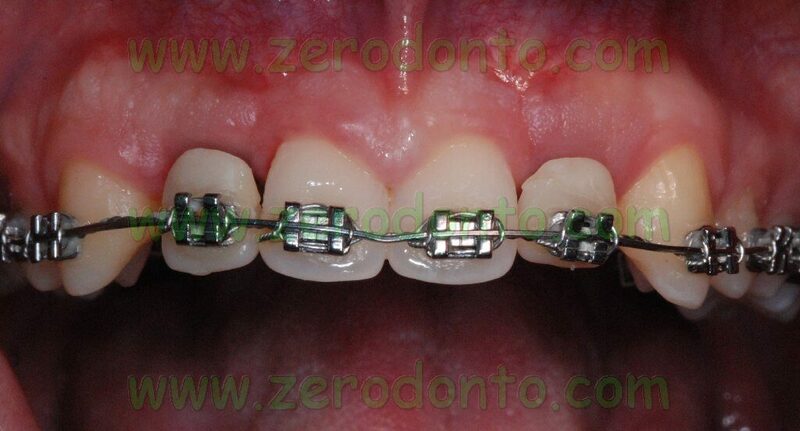 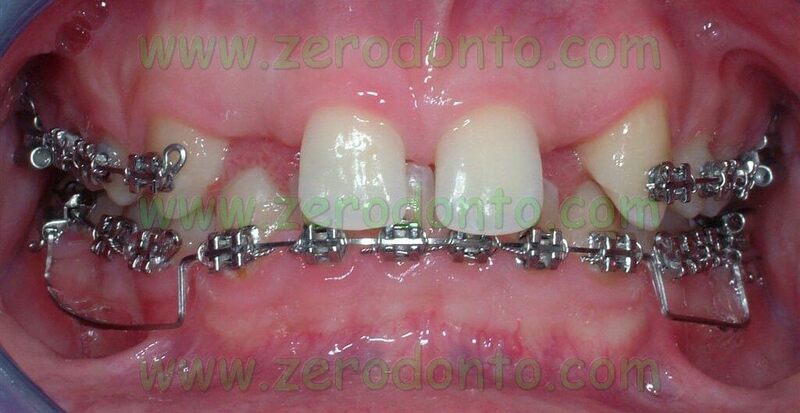 An orthodontic treatment was proposed to the patient in order to optimize the dental spaces and to solve the deep bite before implant placement. 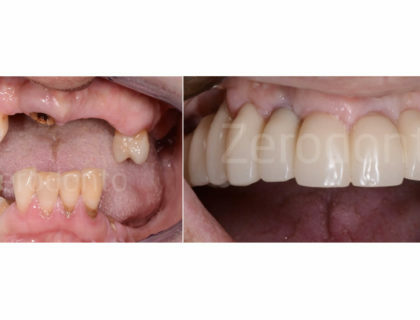 The ideal treatment would have provided a reduction of the central diastema to be completed by means of laminate veneers. 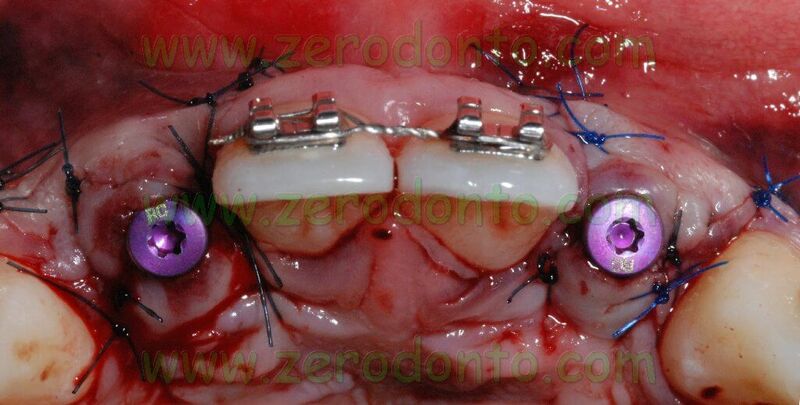 Such a choice would have improved the esthetic result, allowing a molar and canine Class I occlusion on both sides. 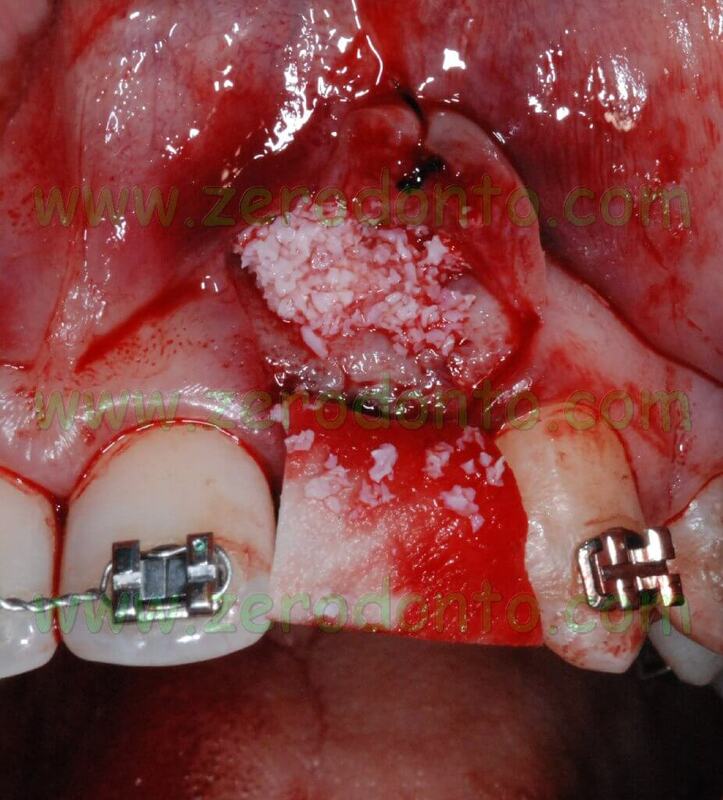 Conversely, the patient did not agree with the proposed shape modification of the central incisors and the risk to renew the veneers after a long term of function. 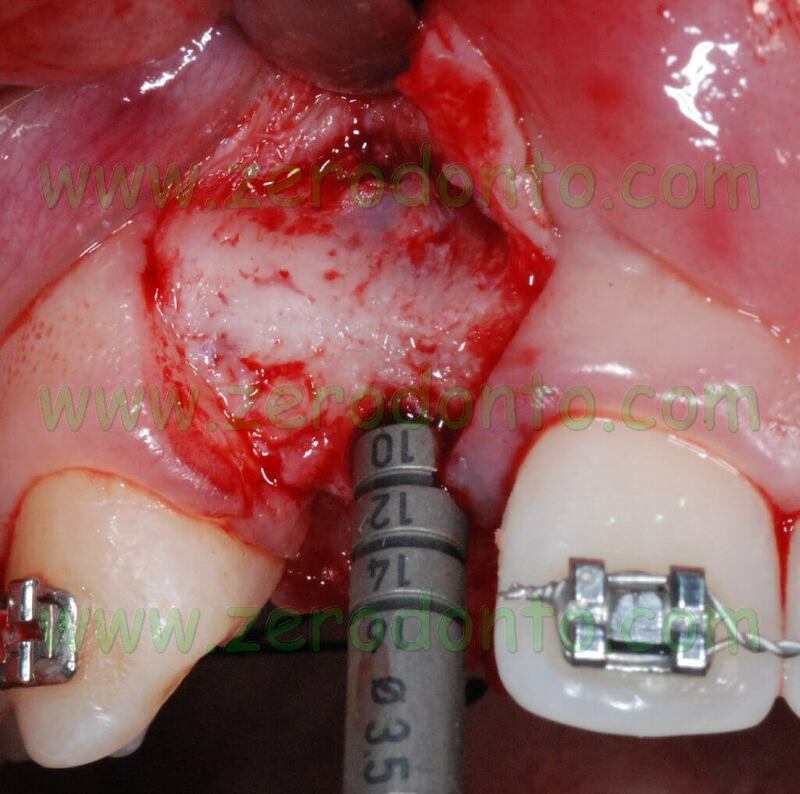 The treatment alternative was planned by means of the mesialization of the maxillary central incisors and, then, of the maxillary posterior teeth, achieving a molar and canine Class II occlusion on both sides. 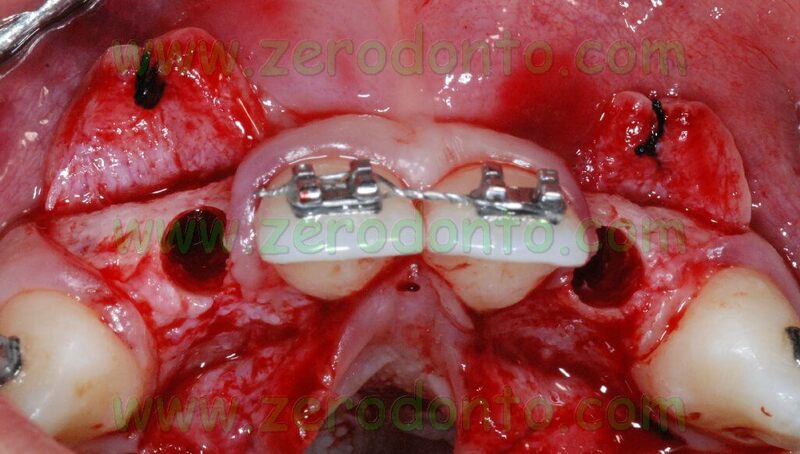 The central diastema was closed, levelling the median line, and the mandibular front teeth were intruded to correct the OVB. 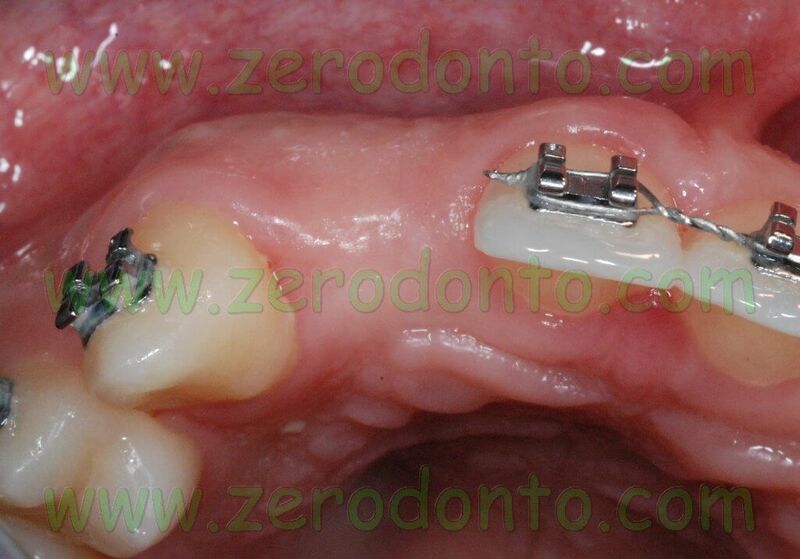 In order to reduce the treatment time, microscrews were later placed to realize intruding levers. 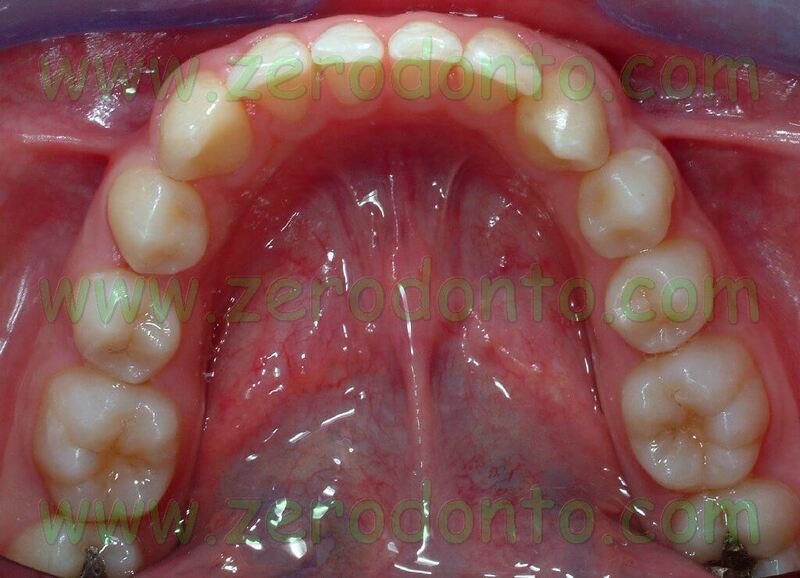 Once the maxillary central incisors were correctly aligned to the median line according to the diagnostic wax up, implant placement could be performed. 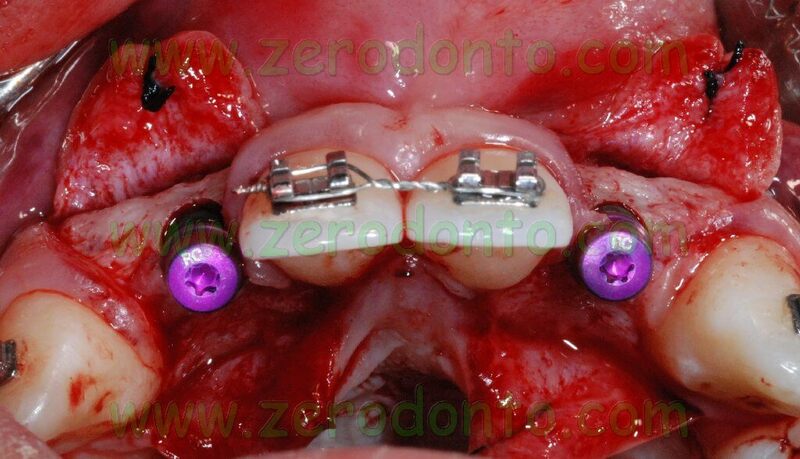 If necessary, the osseointegrated implants could be used as orthodontic anchorage to carry on the mesial movement of the maxillary arch. 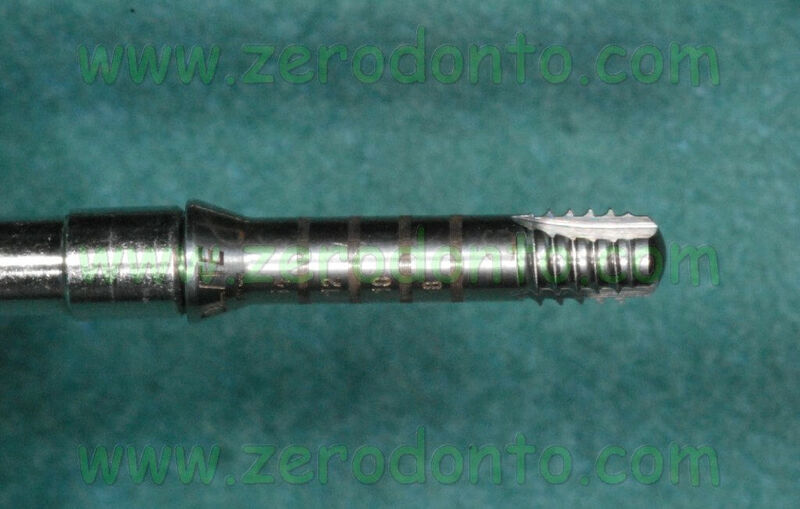 A Bard Parker 15C blade was used to make a paramarginal surgical incision at level of the maxillary central incisors and of the canines with two vertical release incisions for each edentulous space at level of the missing lateral incisors. 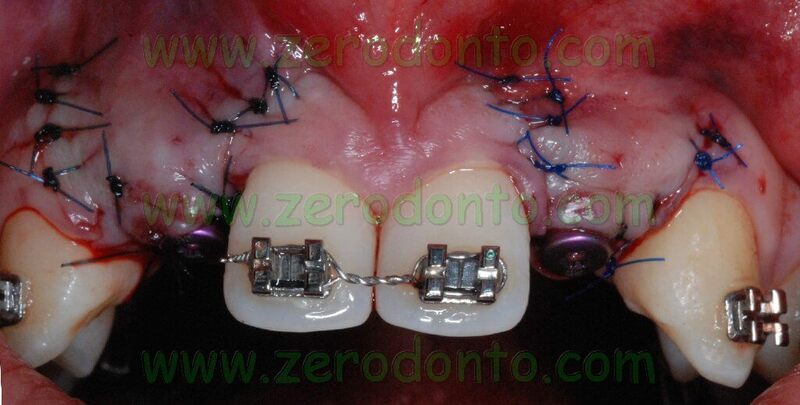 Such an incision is performed to avoid any possible minimal recession of the soft tissues occurring when an intrasulcular incision is made and to preserve the height of the interproximal papillas as well. 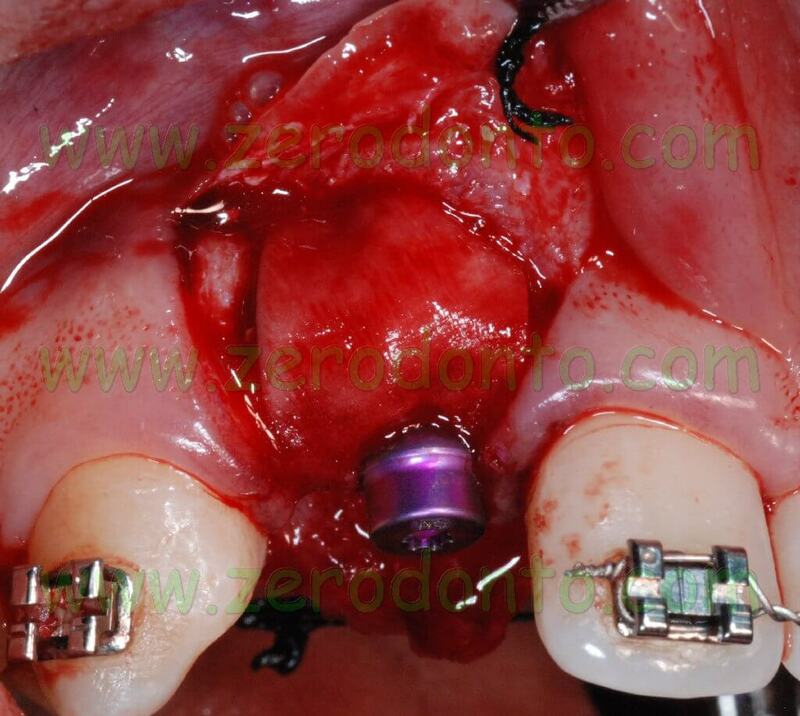 After elevating the flap, an hourglass-shaped alveolar bone profile was evidenced. 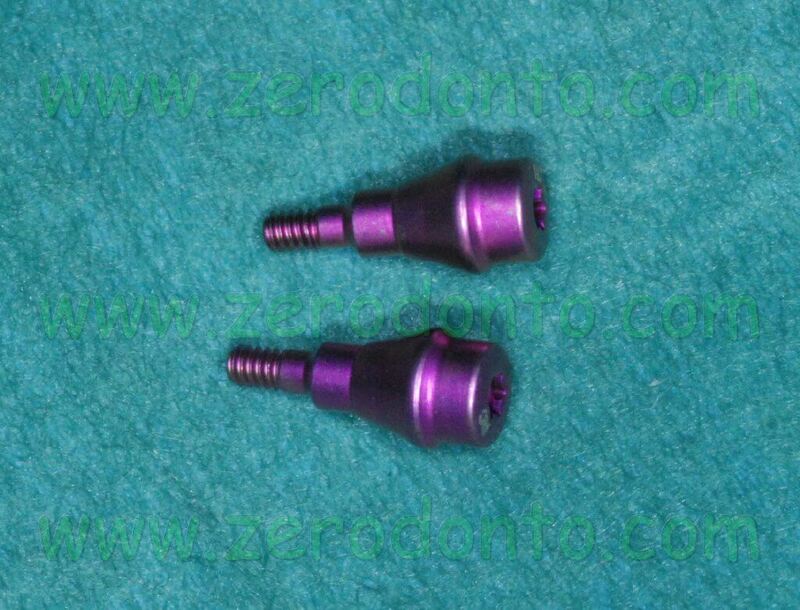 Consequently, after using the ball-shaped drill to create an access hole in the cortical bone, the implant site was prepared using osteotomes. 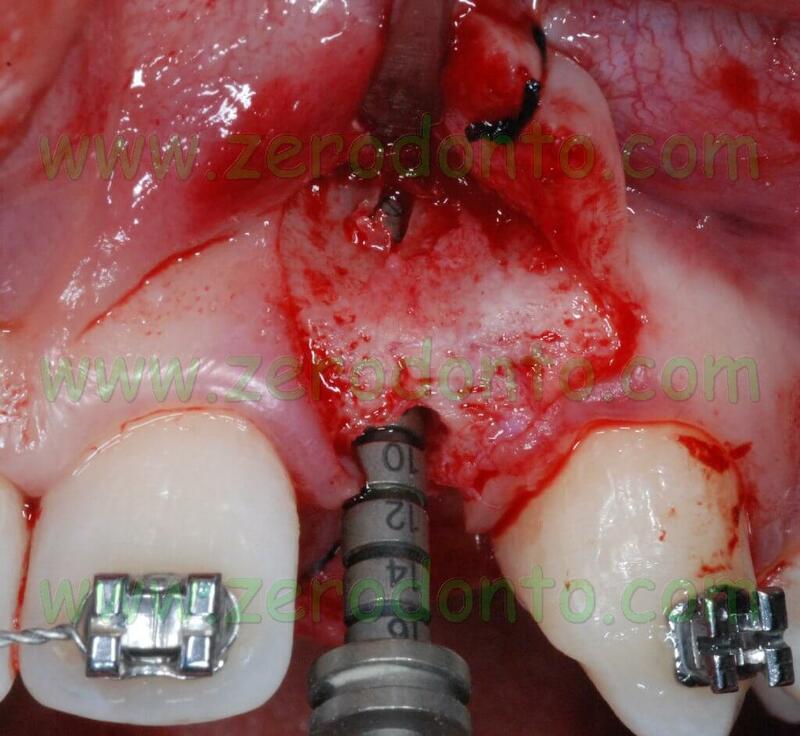 Such a surgical approach was chosen to expand as much as possible the apical portion of the alveolar ridge so as to reduce the implant fenestration. 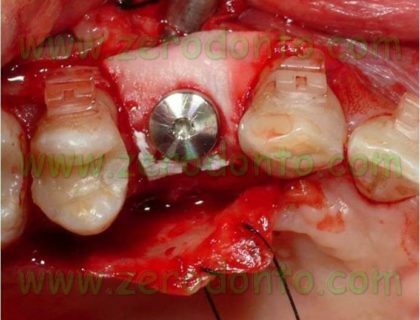 Such an occurrence can be successfully managed; to date, several clinical studies proved that implant fenestrations are compatible with a good implant healing. 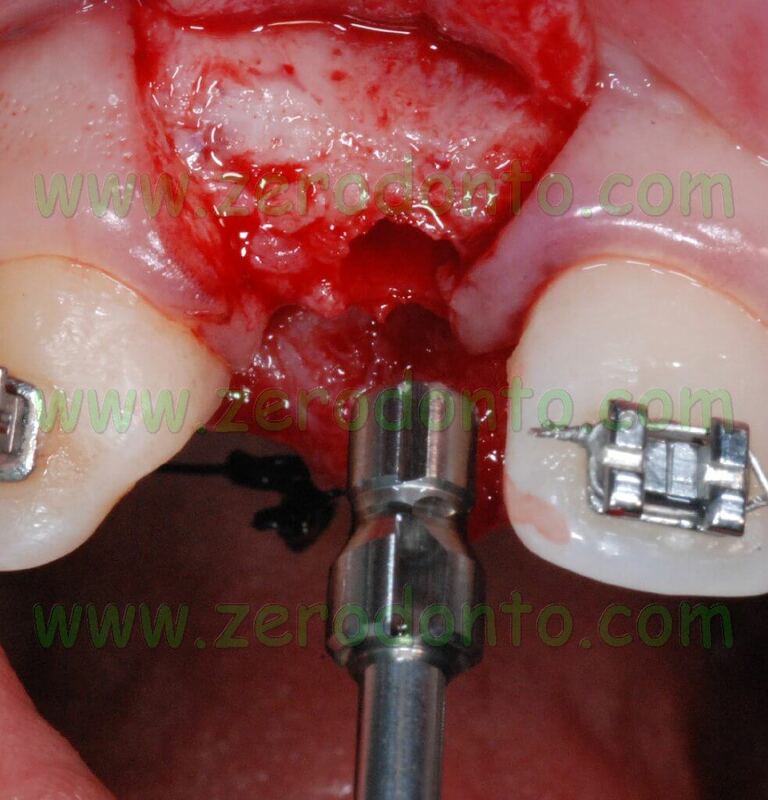 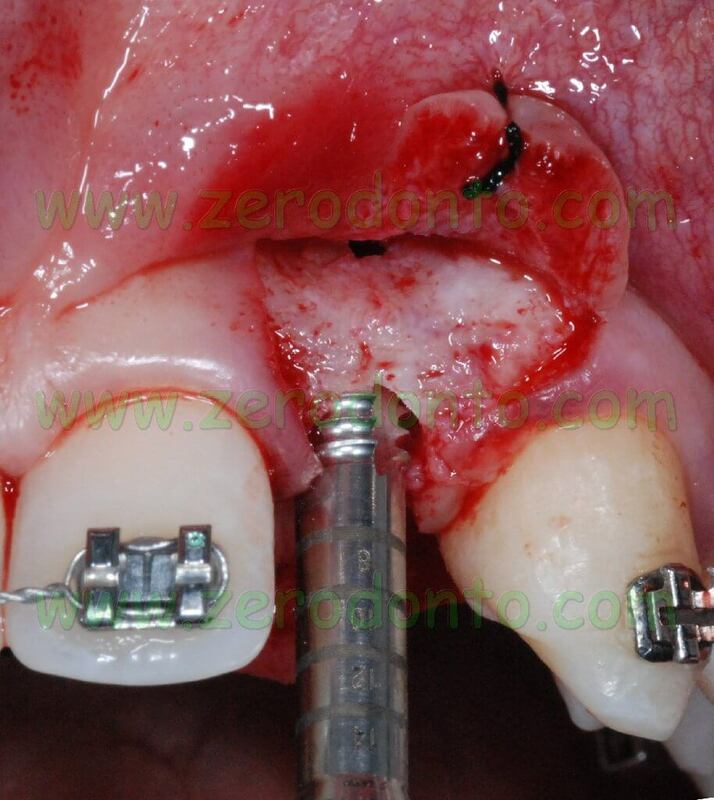 Implant dehiscence is different from implant fenestration: it can be described as a real recession starting from the implant neck and always requires bone regeneration techniques to guarantee a good stability of periimplant soft tissues. 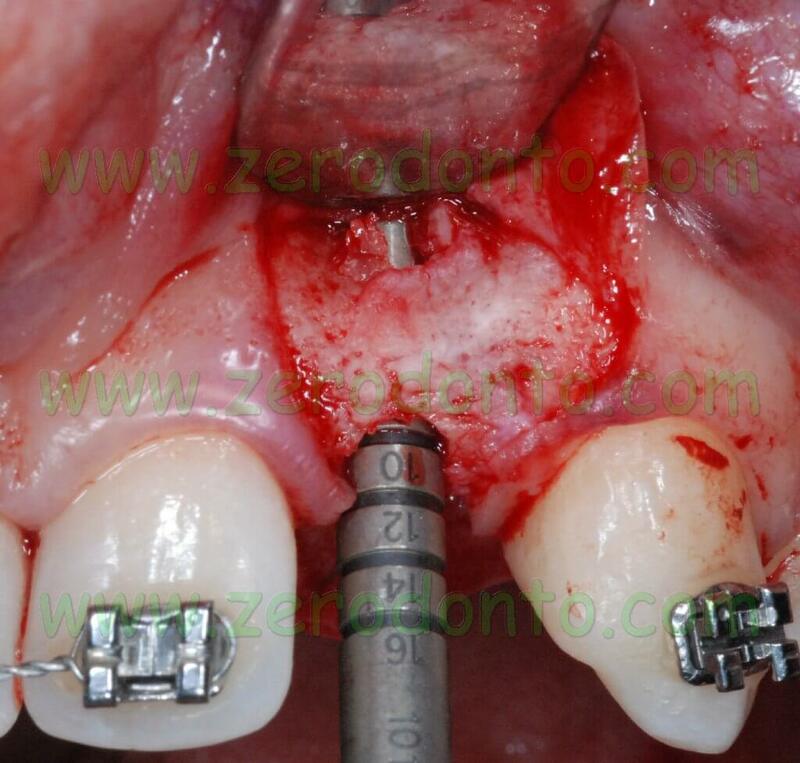 On such an evidence-based background, it was planned not to treat fenestrations in order to achieve a prosthetically-guided implant placement and to use straight abutments. 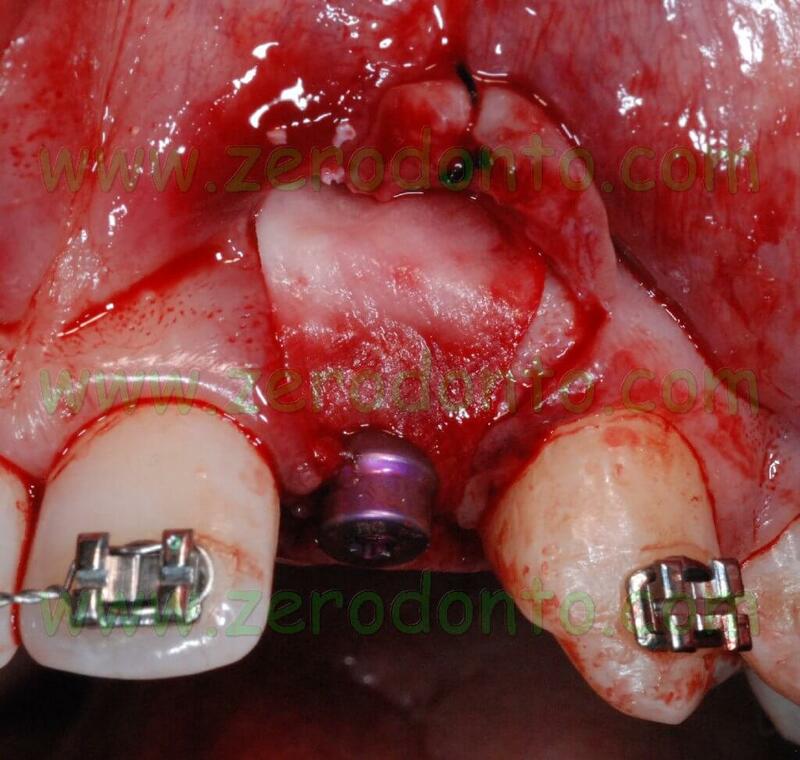 It was decided to place 2 Bone Level Straumann submerged implants with a diameter of 4.1 mm using a non submerged surgical technique. 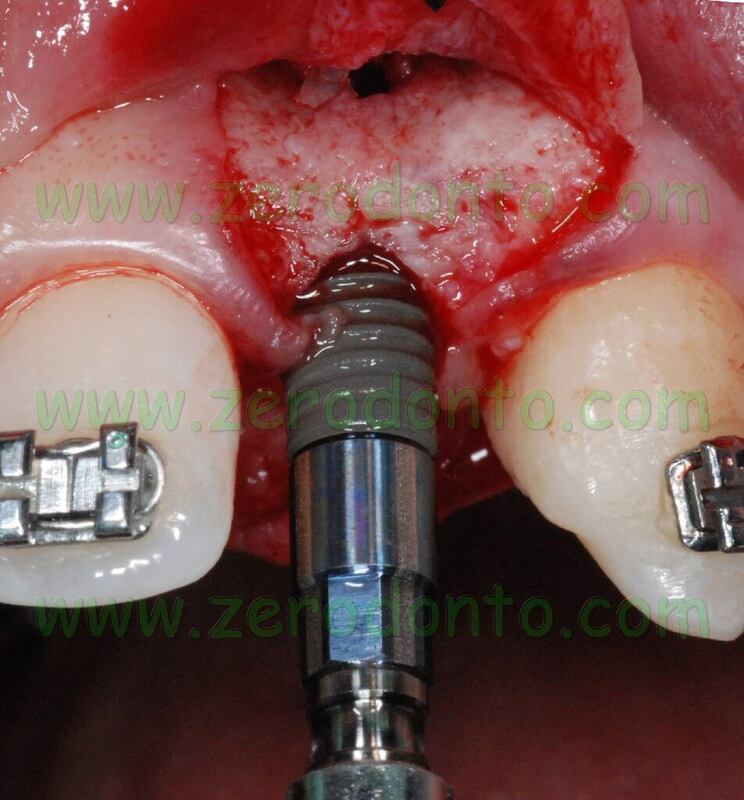 For the rehabilitation of lateral incisors with non submerged implants, we usually use Narrow Neck implants with an emergence diameter of 3.5 mm, smaller than the Regular Neck implants with a diameter of 4.1 mm and an emergence diameter of 4.8 mm, which would be too wide for lateral incisors. 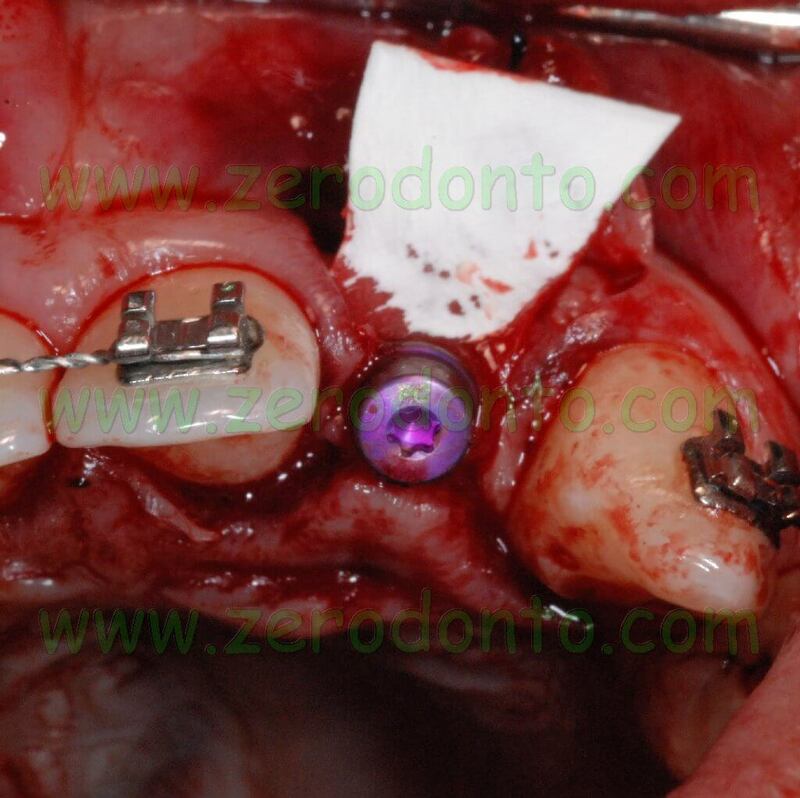 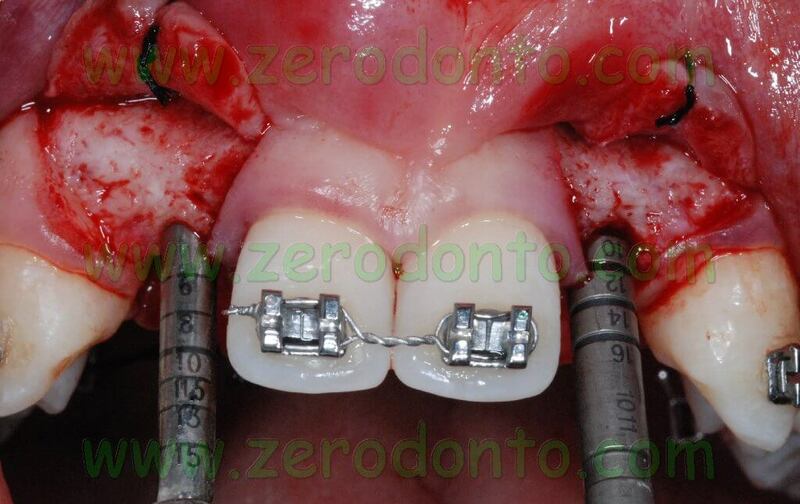 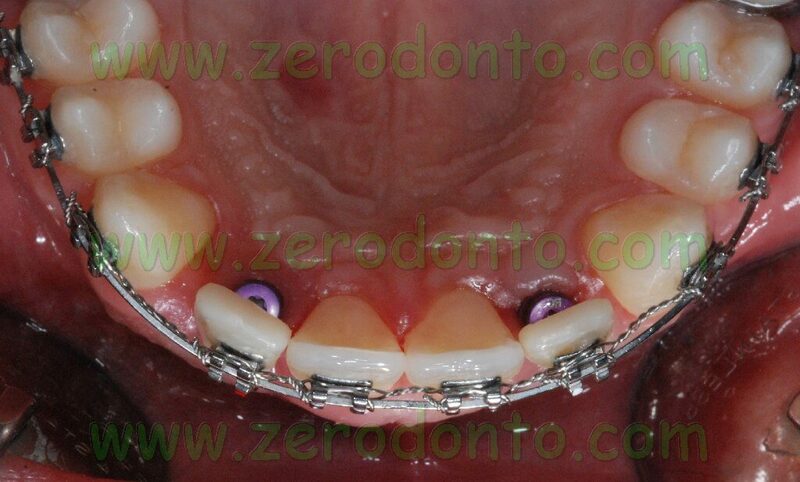 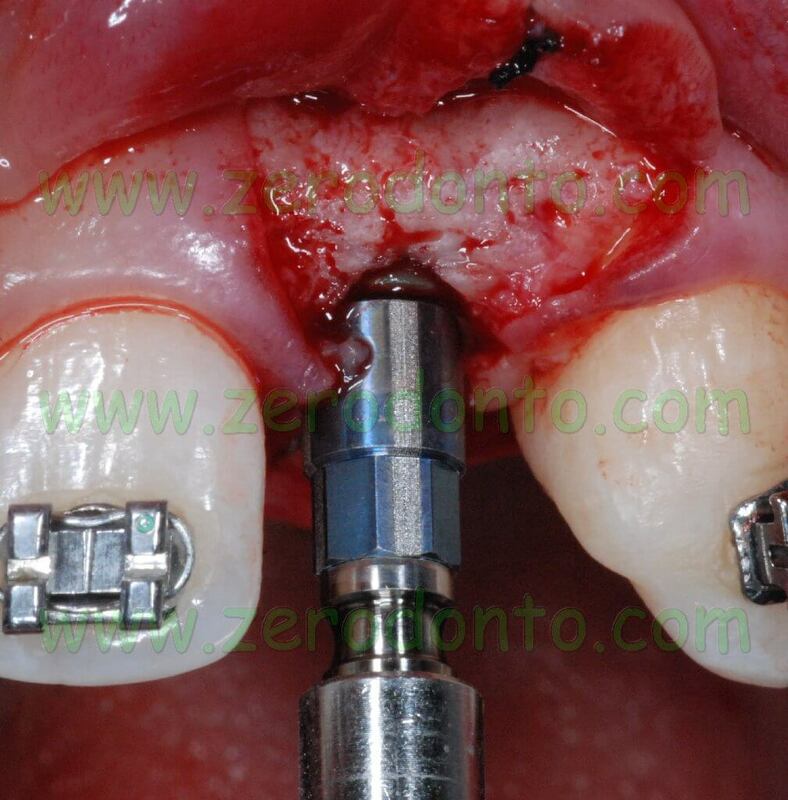 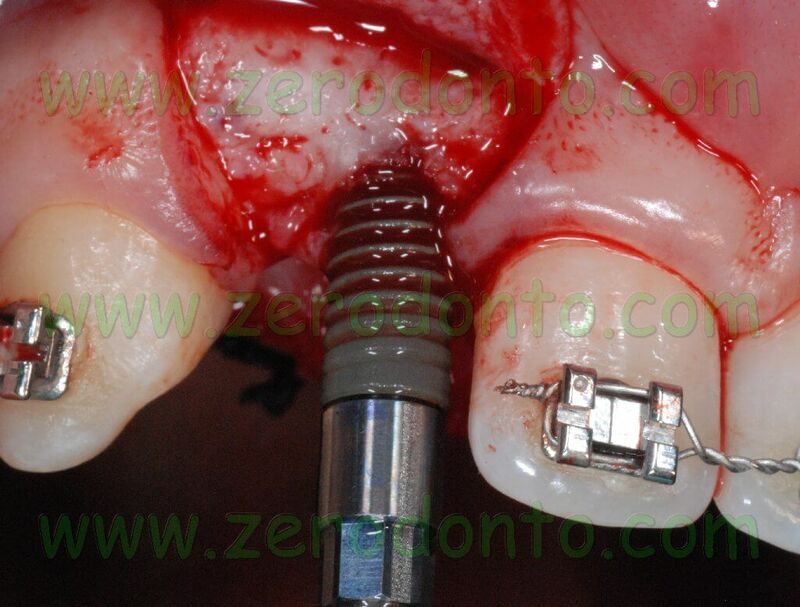 Since Bone Level submerged implants were used in this case, the emergence surface of the abutment was smaller than the diameter of the implant, due to the crossfit implant-abutment connection. 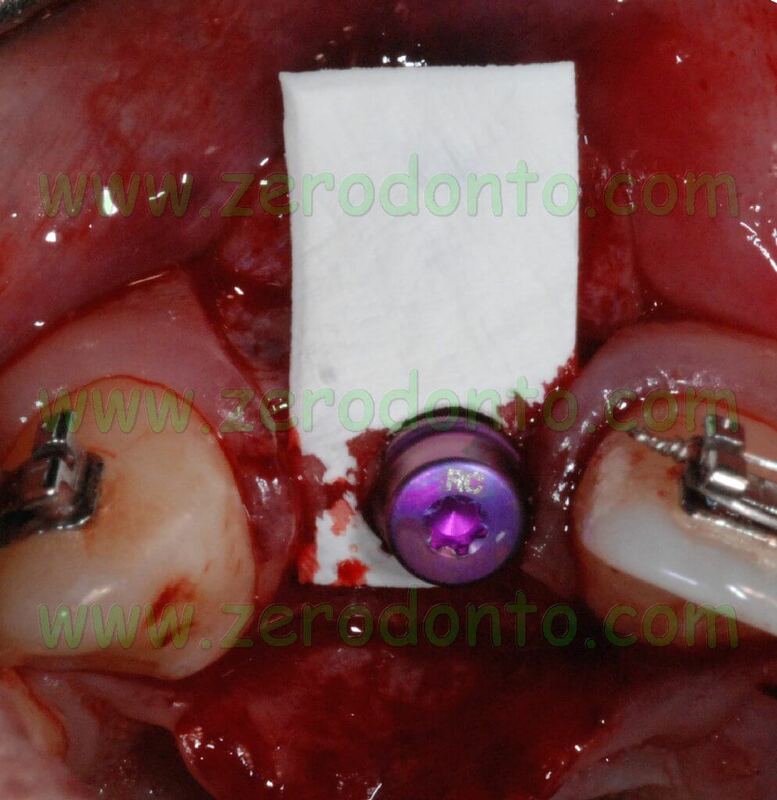 The abutment was prepared in the dental laboratory, consequently its diameter was modified fitting the ideal emergence profile of lateral incisors. 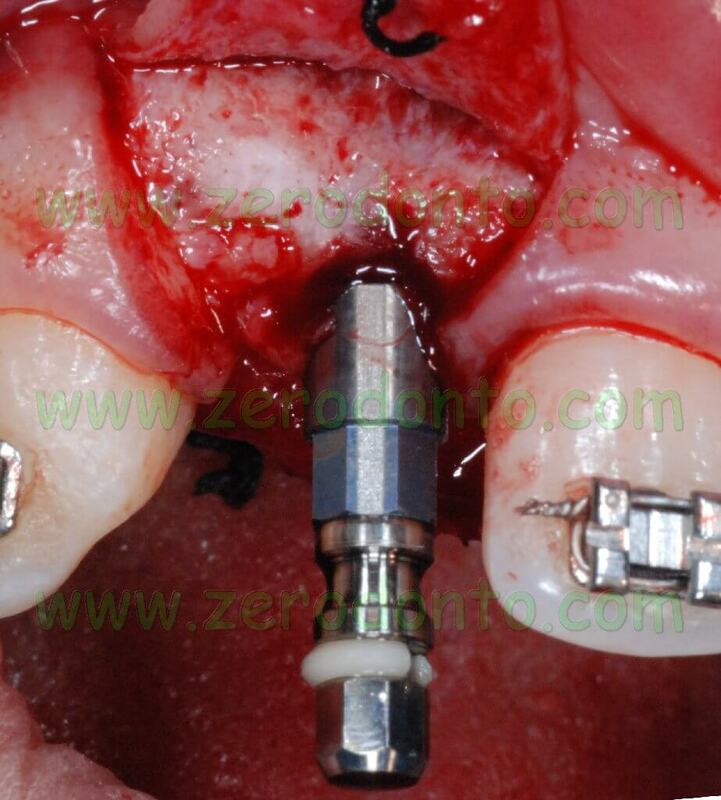 In such cases, the diagnostic wax-up is paramount. 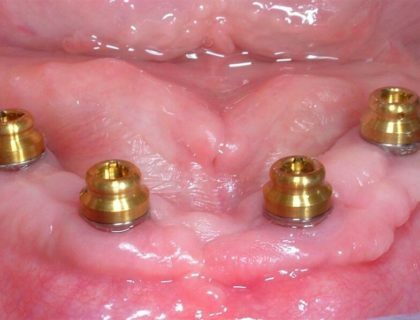 After considering the dimensions of the edentulous space, the implant site was prepared in the ideal position till a depth of 10 mm. 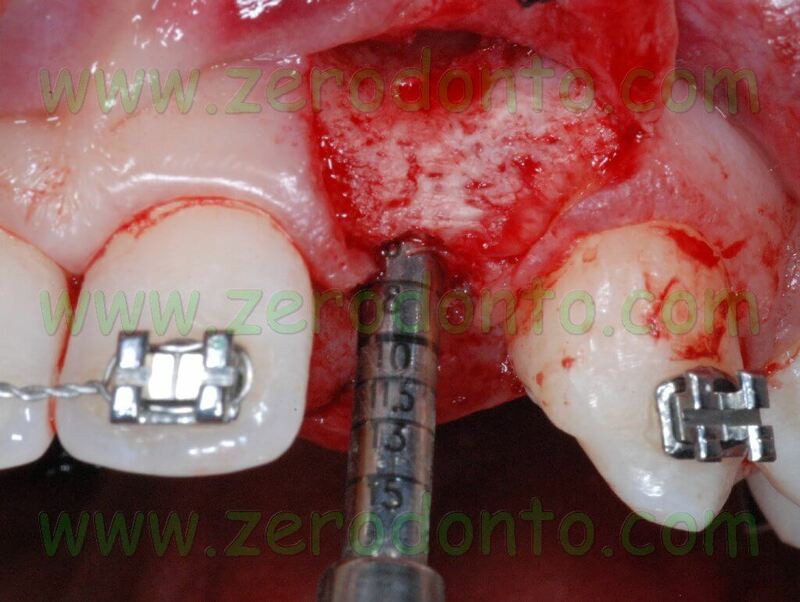 The use of non submerged implants allows the clinician to place the implant neck at the level of the bone crest; as a consequence, the implant site has to be prepared to a depth equal to the implant length. 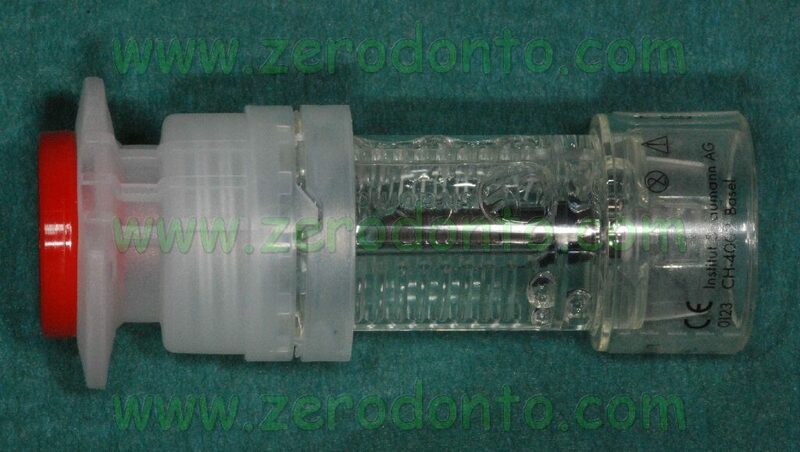 After preparing the implant site by means of bone expanders and by the 3.5 mm diameter bur, a specific cone-shaped bur was used according to the standard protocol, since the Bone Level implants are cylindrical at level of the threads but with a conical body. 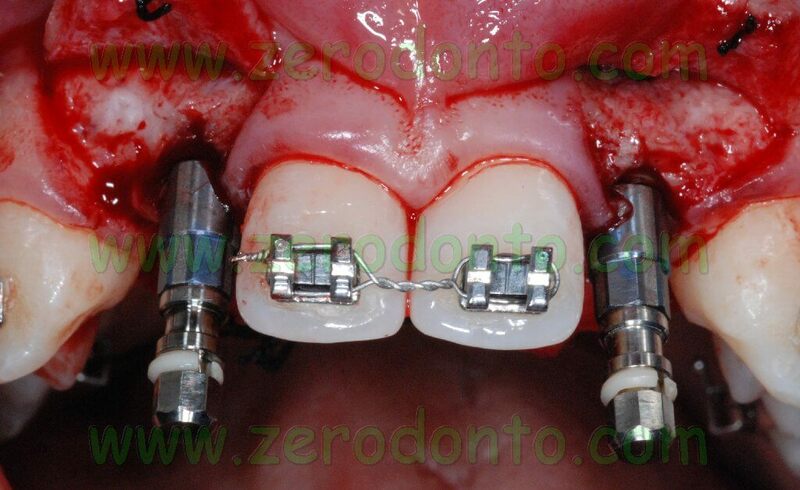 According to the standard protocol, a hand threading device was used, since these implants are not self-threading. 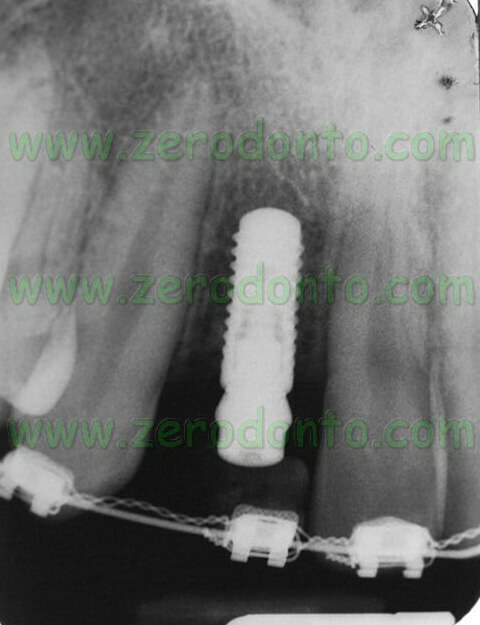 Then, two Straumann Bone Level SLActive implants with a diameter of 4.1 mm and a length of 10 mm were placed. 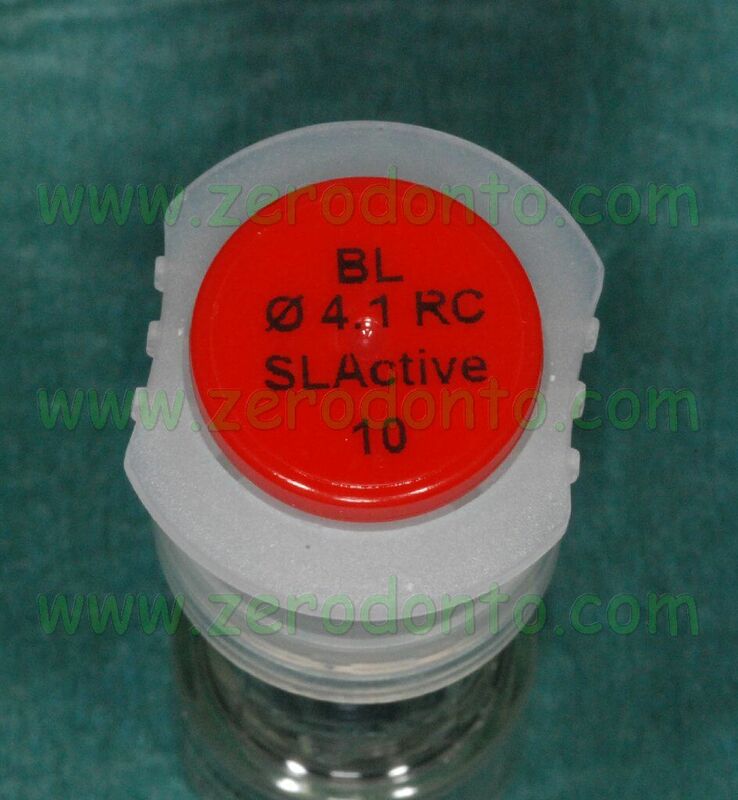 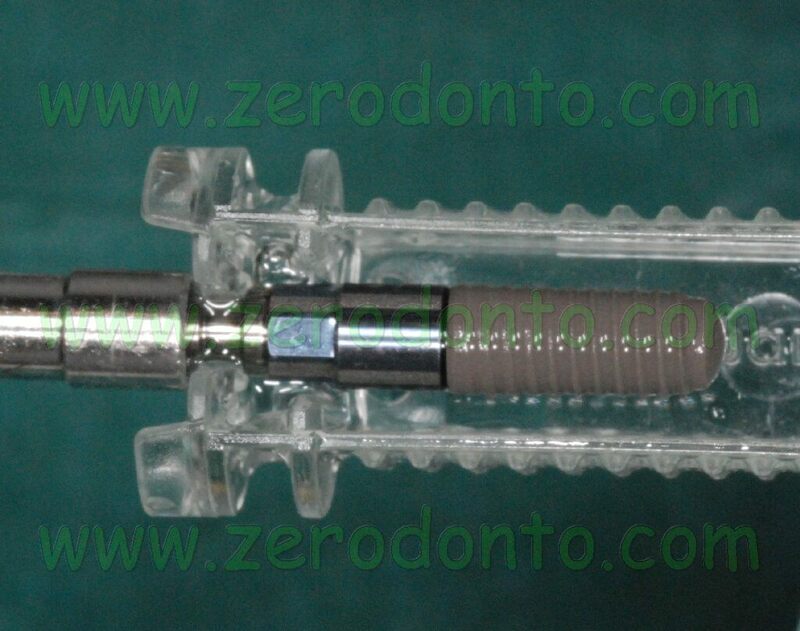 The Bone Level implants are characterized by the SLActive surface which makes the process of osseointegration faster. 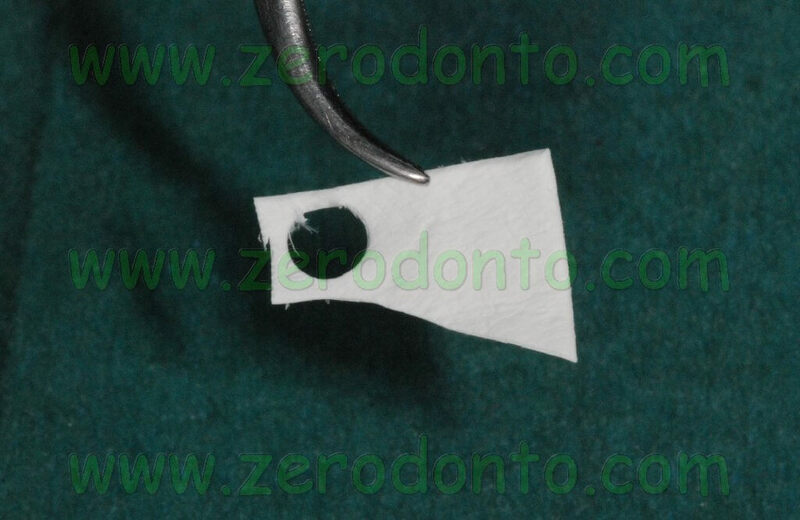 The “bone control design” provides the preservation of the crestal bone and the stabilization of the periimplant soft tissues, allowing the biological dimension to develop horizontally. 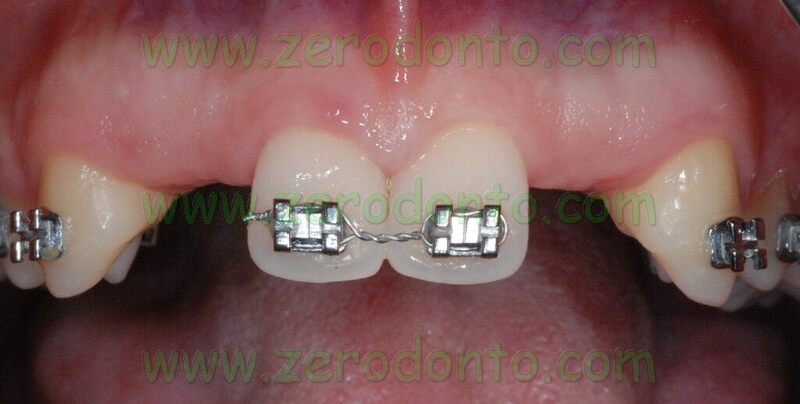 In this case, it is better to define it as biological distance. 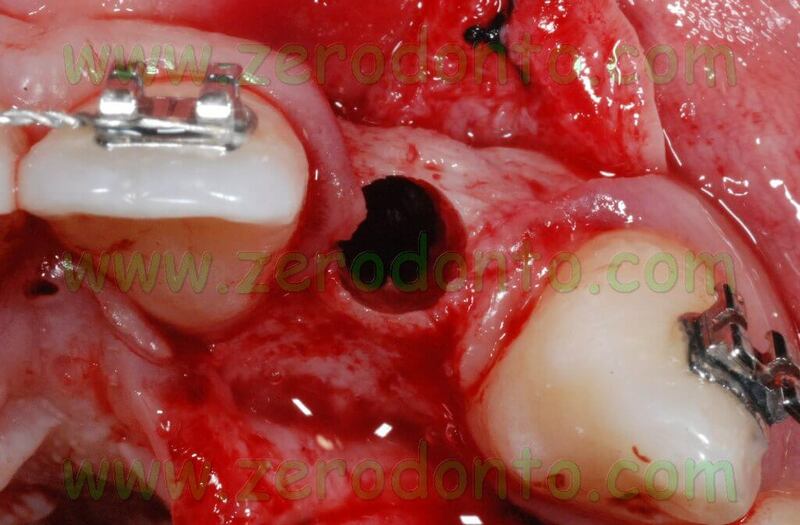 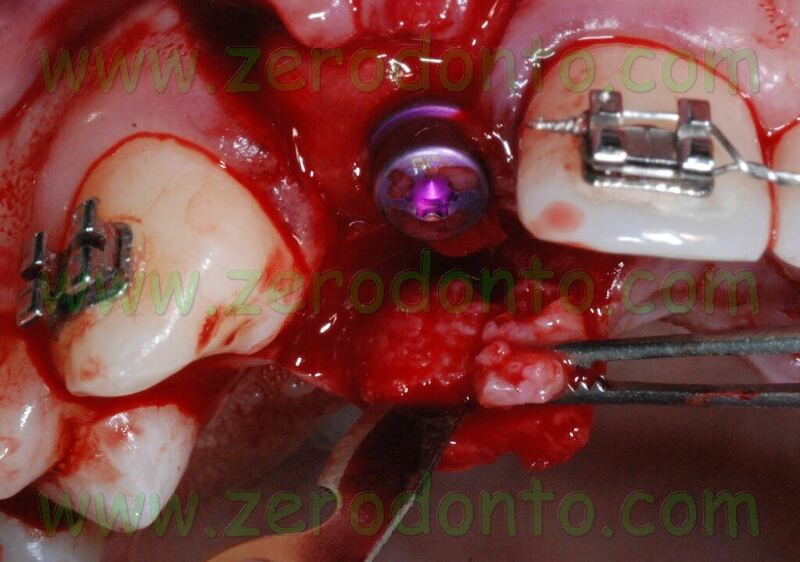 Moreover, the conical connection allows a reduction of micromovements and micorgaps between the fixture and the abutment. 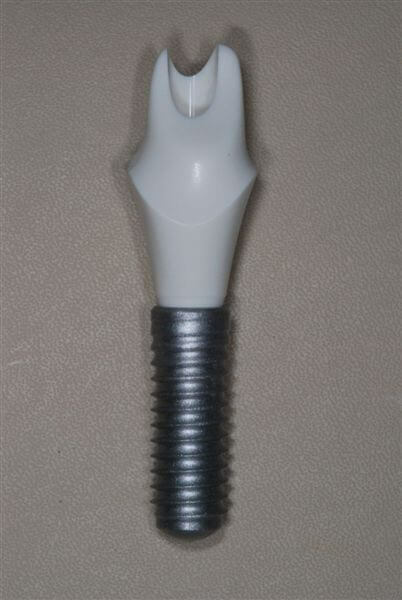 The standard protocol indicates that one of the four white stripes at level of the implant mounter is placed buccally during implant placement. 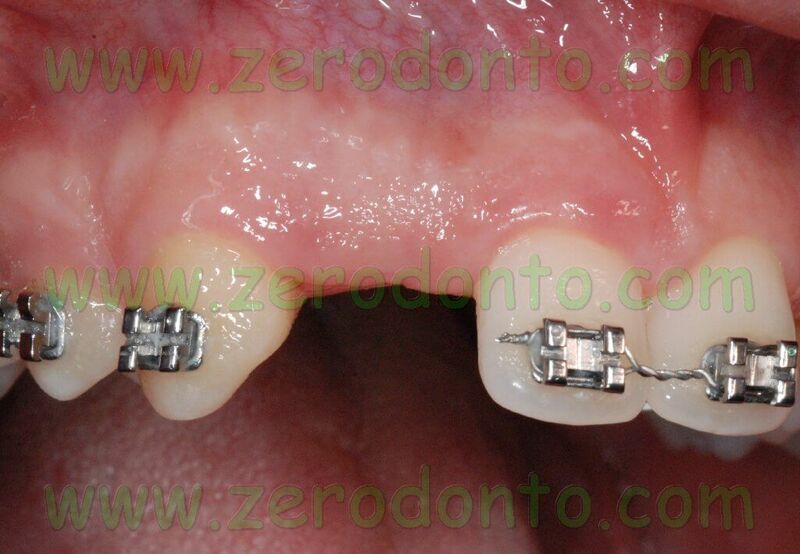 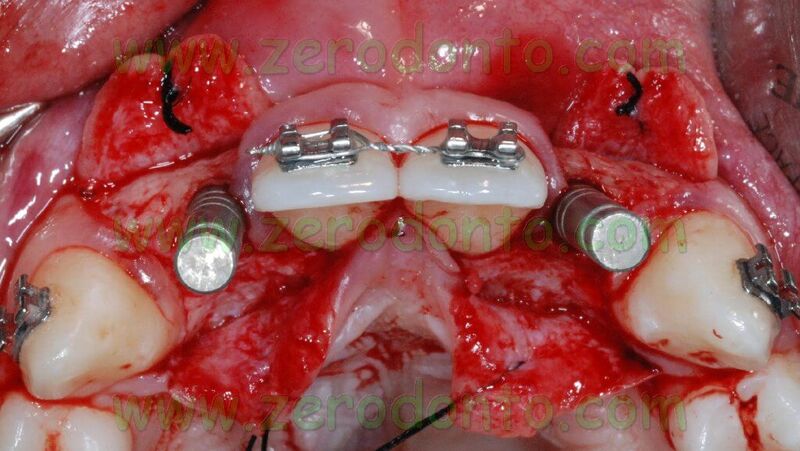 This is paramount from a prosthetic point of view, since a squared connection is present inside the implant and not an octagonal connection just like in non submerged implants. 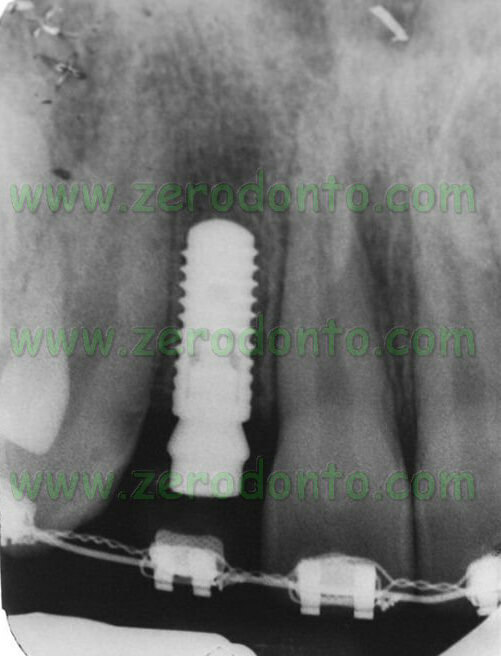 After the two implants were placed, two high bottle-shaped healing screws were screwed onto the implants, in order to allow a non submerged healing. 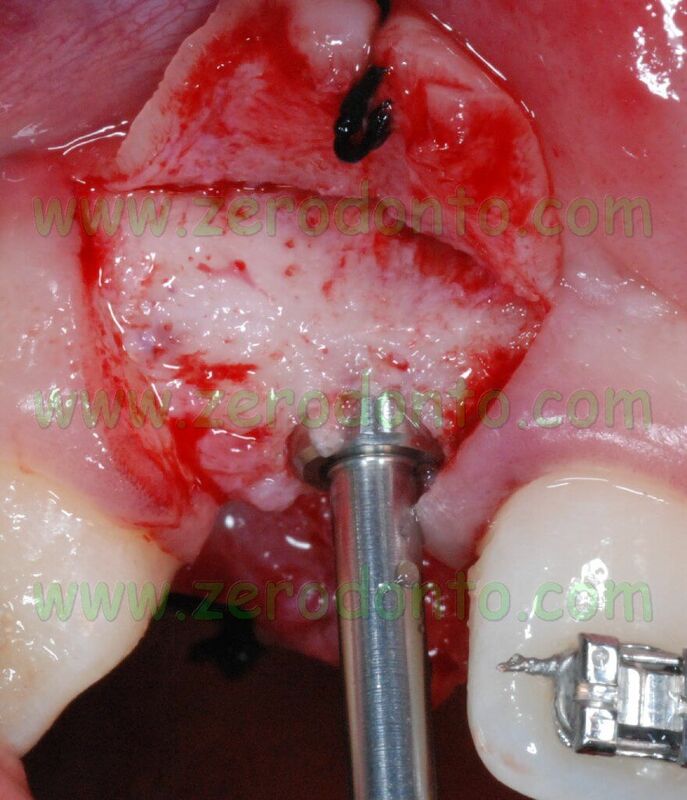 Then, a guided bone regeneration (GBR) was performed at level of the above mentioned fenestrations. 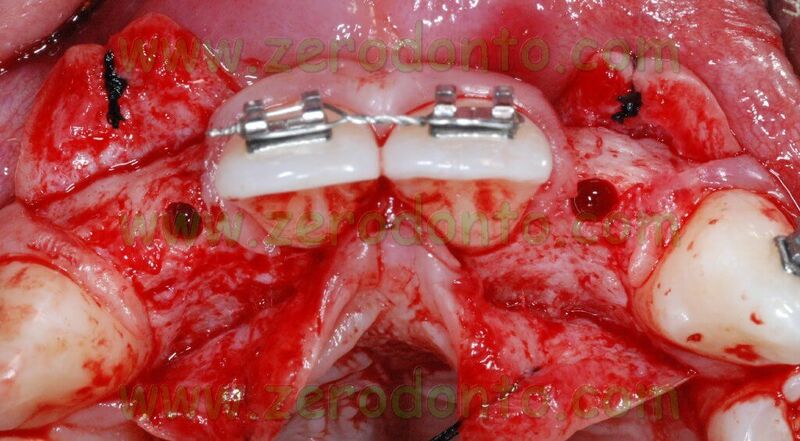 A BioGide collagen membrane was cut and fixed at the implants’ neck to hold a BioOss graft placed over the fenestrations. 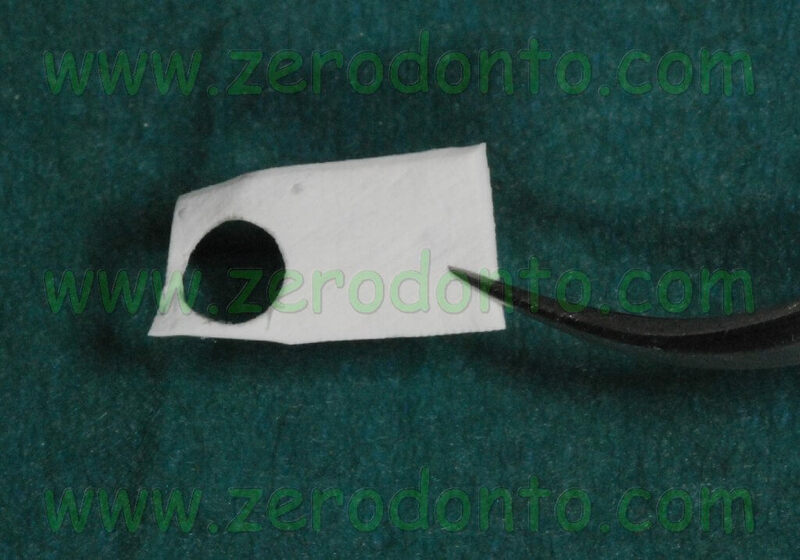 In order to improve the stability of the membrane preventing any micromovement, a hole with a diameter of 4 mm was cut in the membrane to fix it at the implants’ neck. 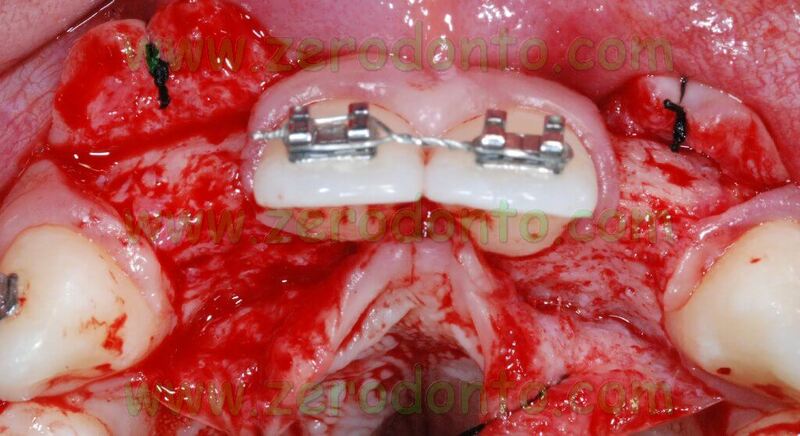 A graft of connective tissue was taken from the palatal flap and was sutured under the buccal flap. 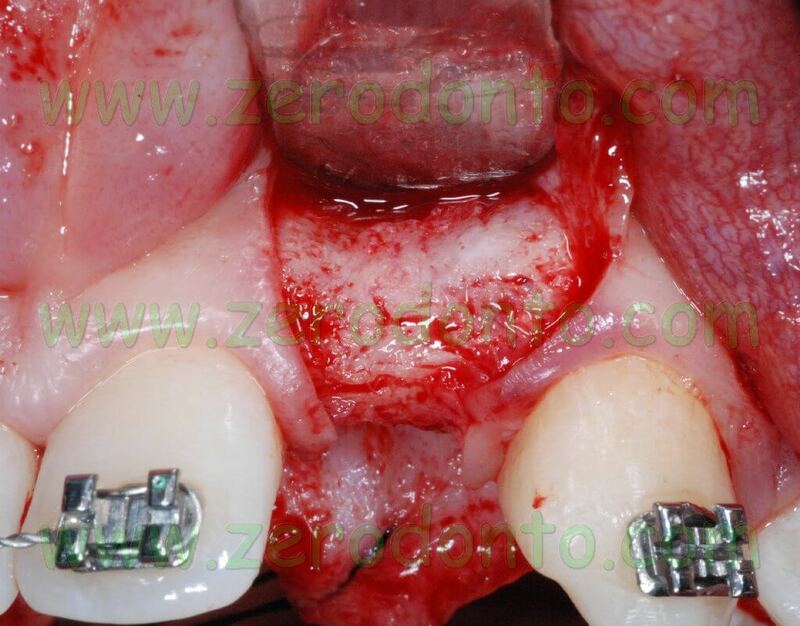 Such procedure allows the clinician to correct the buccal deficit and to modify the gingival biotype, ensuring a better stability of soft tissues in the long term. 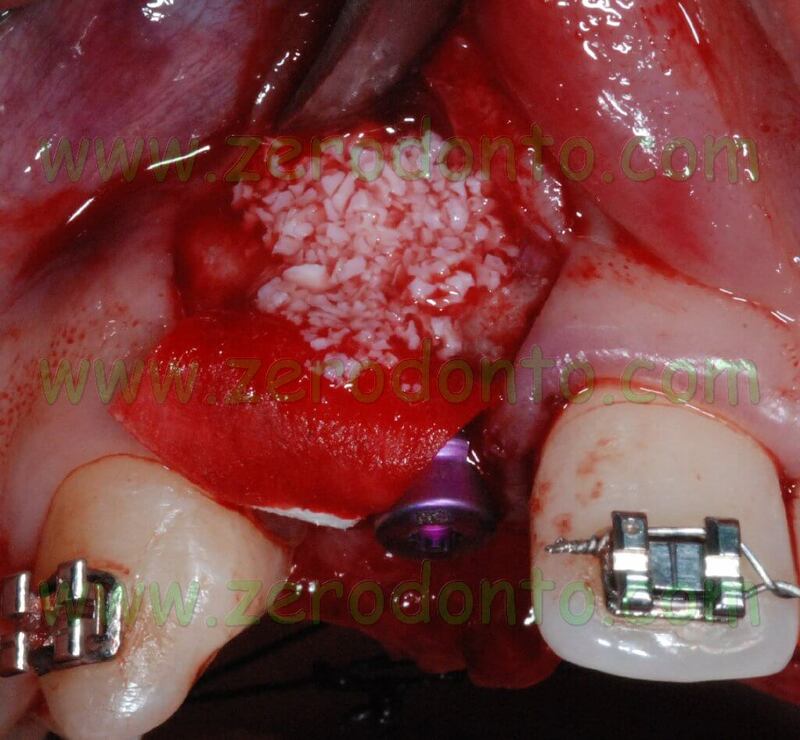 After mobilizing the buccal flap with a cut at level of the periosteum, a 6.0 monofilament polyamide suture with separate points was performed. 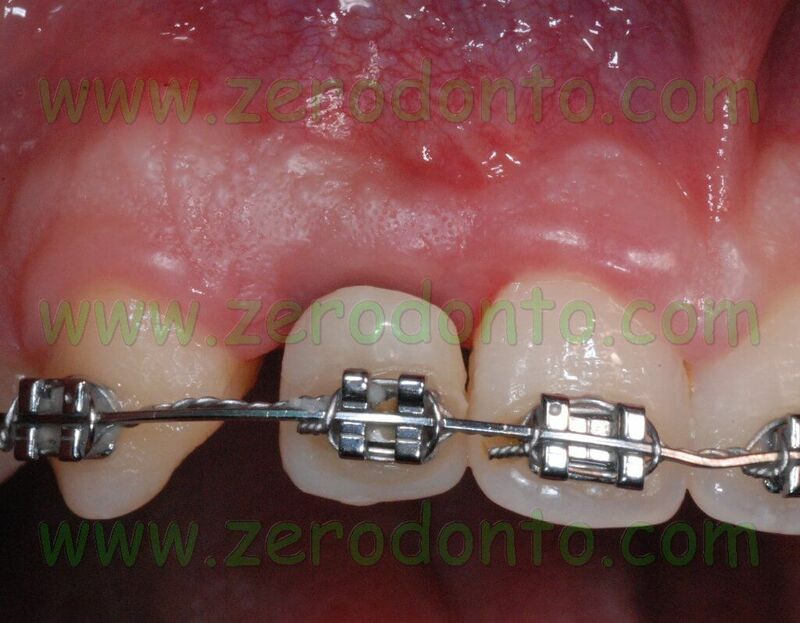 Two provisional resin shells were fixed onto the orthodontic wire at level of the missing lateral incisors to improve the patient’s esthetic. 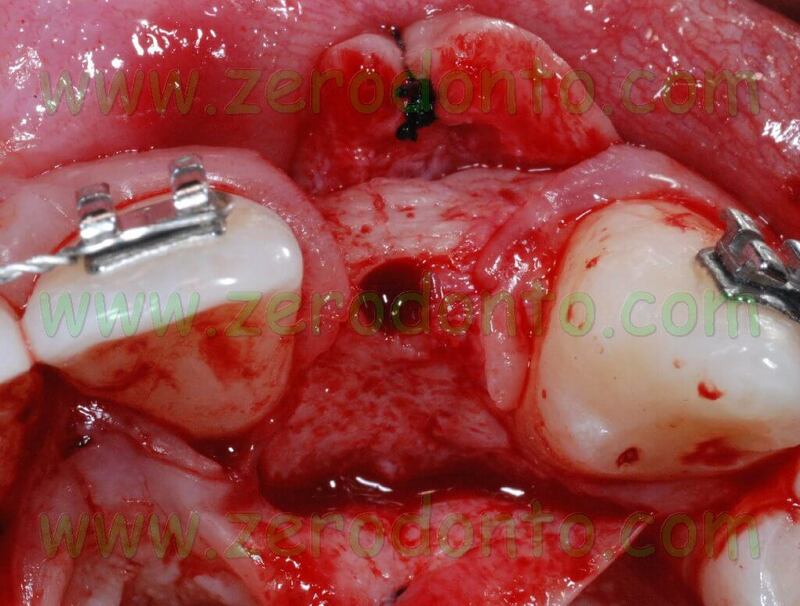 The present clinical case did not strictly followed the standard protocol due to specific local conditions and clinical needs. 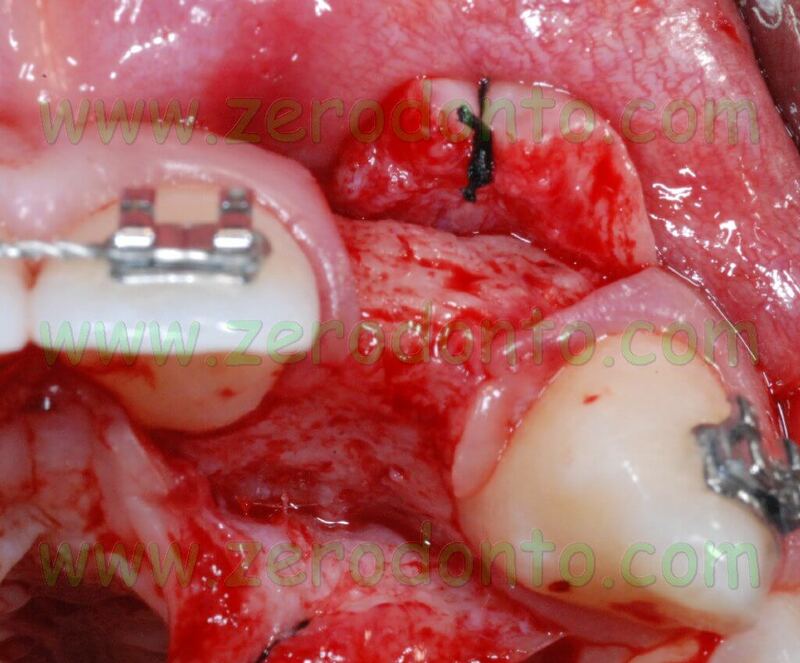 After this first surgical experience, the Bone Level implants proved to be easy to handle. 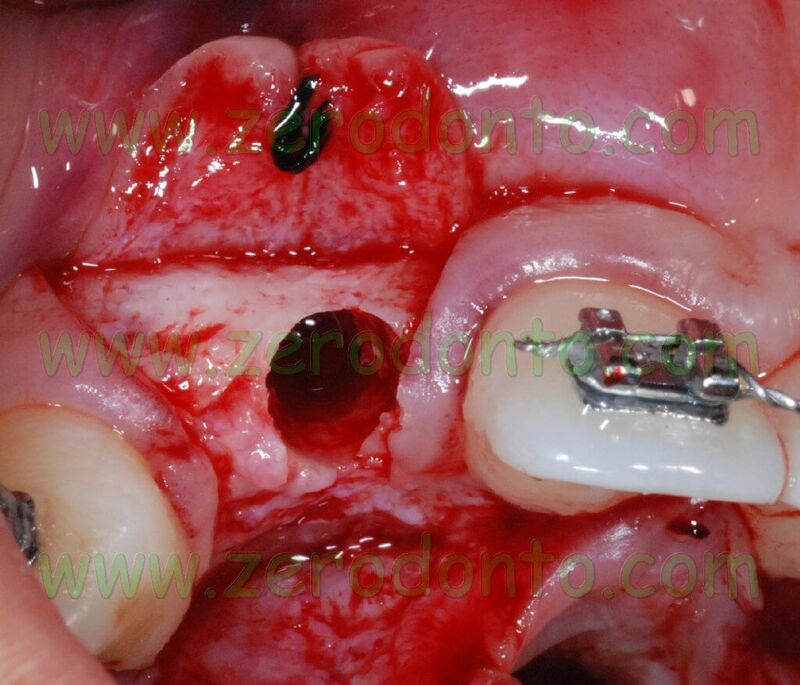 Just one more surgical bur is necessary in comparison with the surgical procedure for Straumann standard implants. 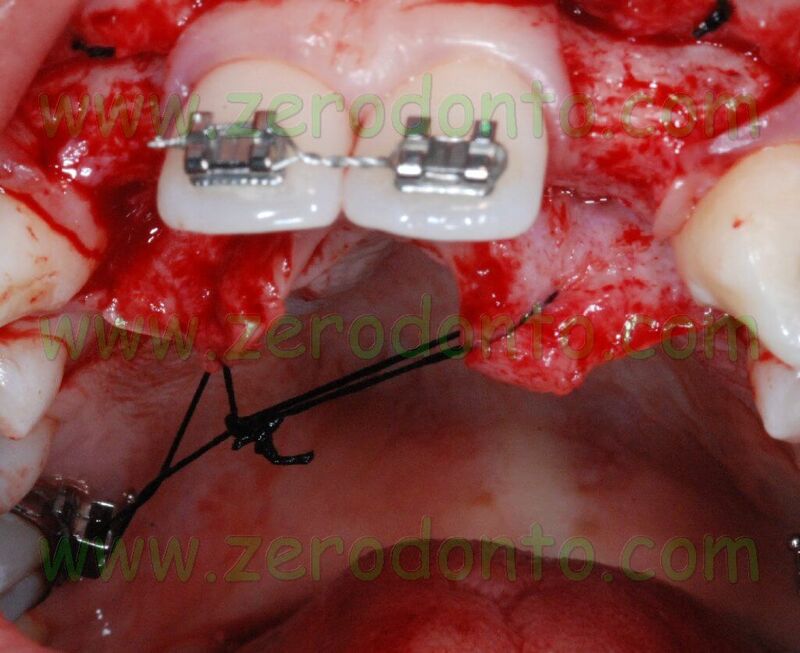 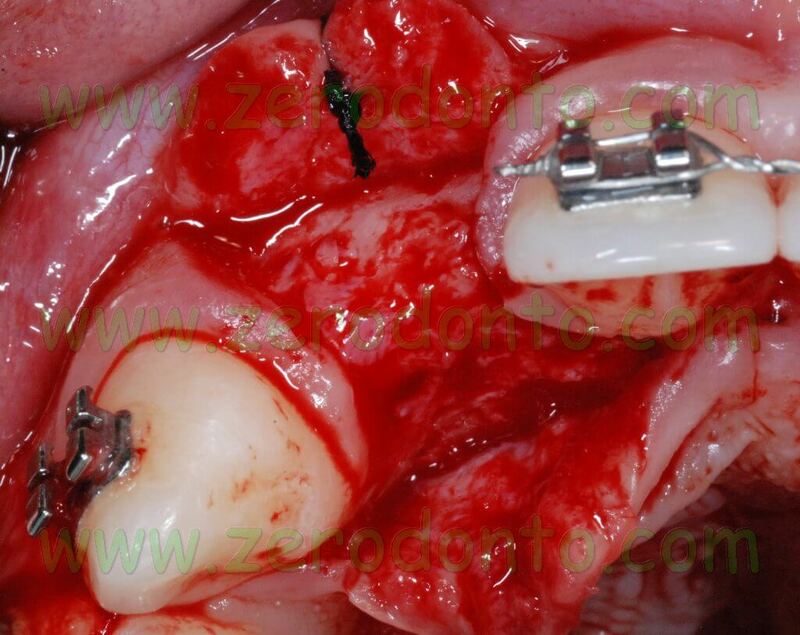 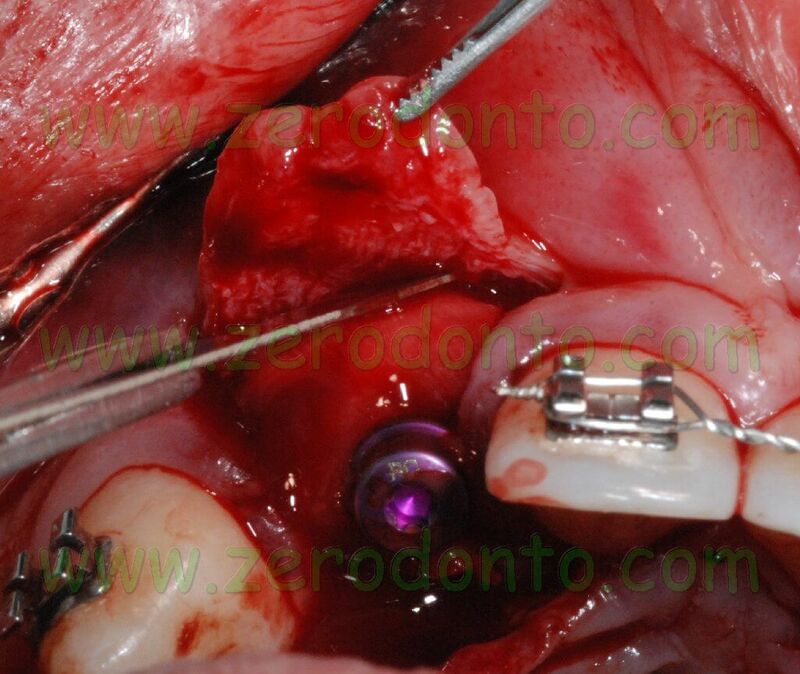 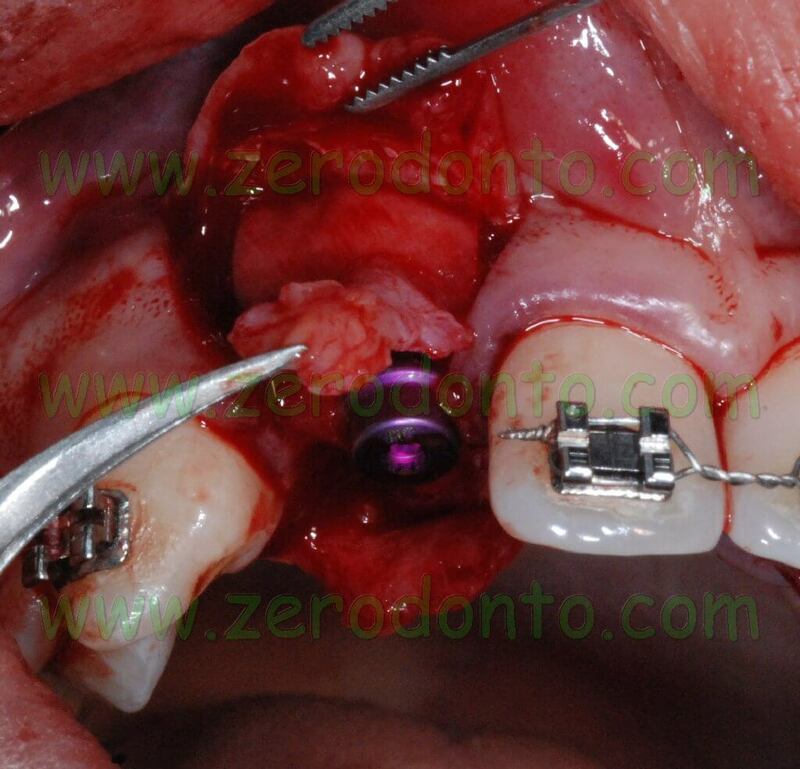 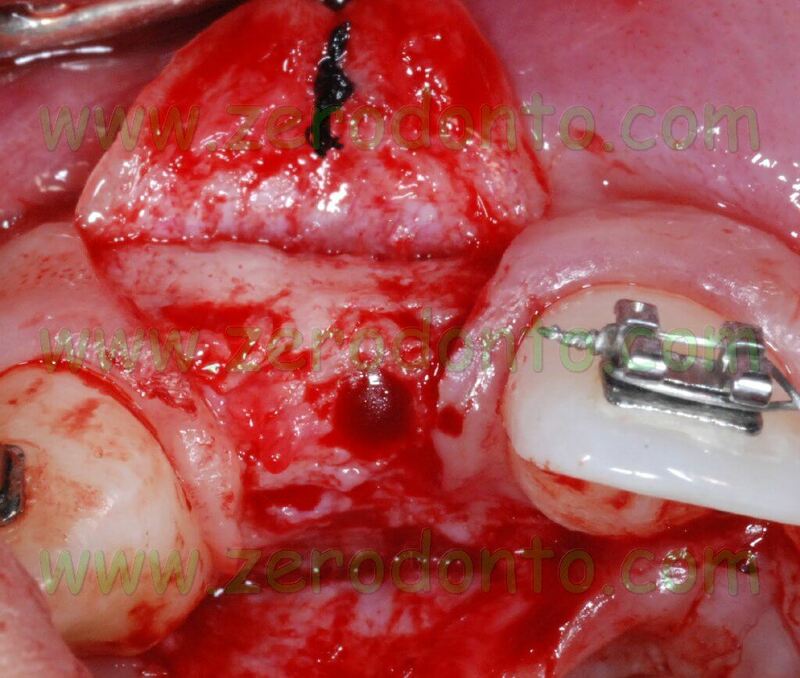 A problem was evidenced during the screwing of the healing screw: the left side implant had not an ideal primary stability due to the buccal fenestration and a micromovement occurred. 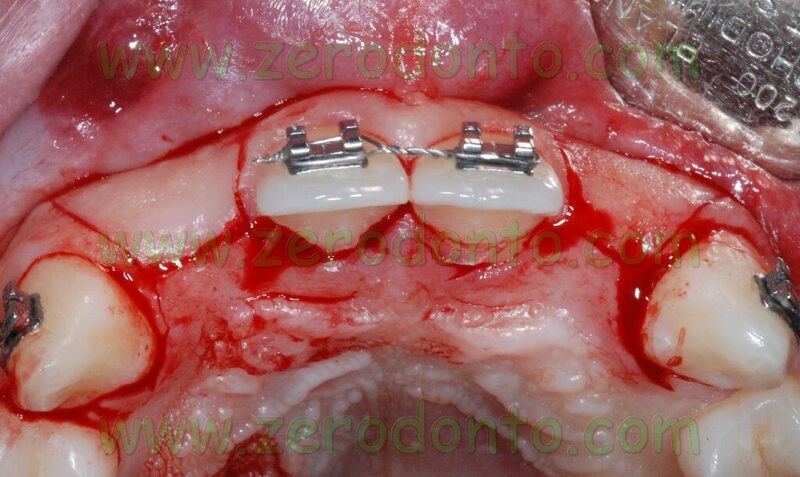 Consequently, the ideal buccal position of the white stripe on the mounter was lost and this influenced the placement of the abutment. 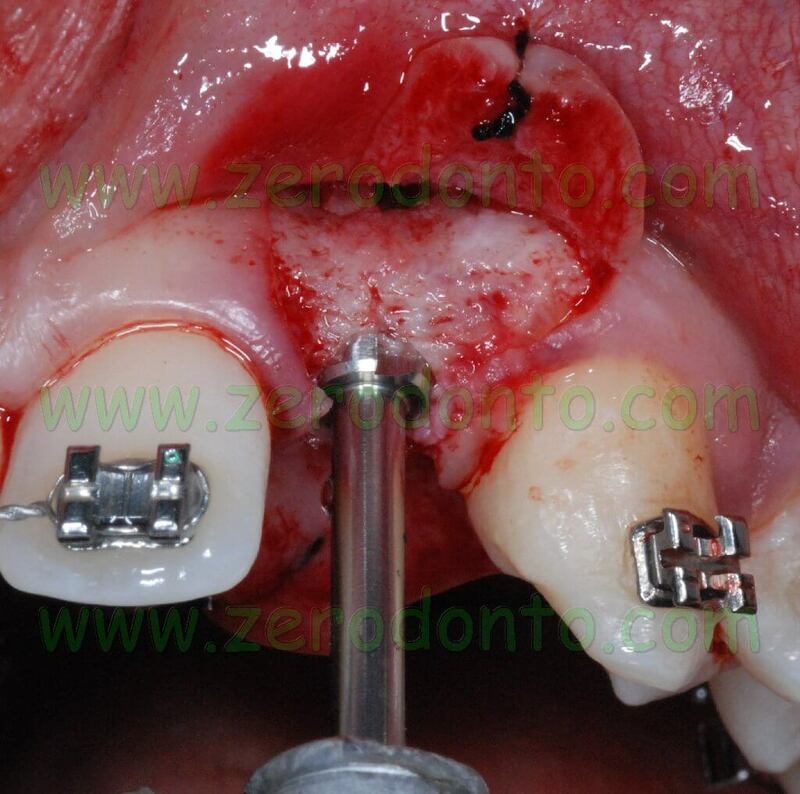 For an oral surgeon used to perform a non submerged implant procedure and to control the conditions of periimplant soft tissues by means of bone regeneration techniques when necessary, the use of a submerged technique may seem more complicated, particularly due to the necessity of a second surgical stage. 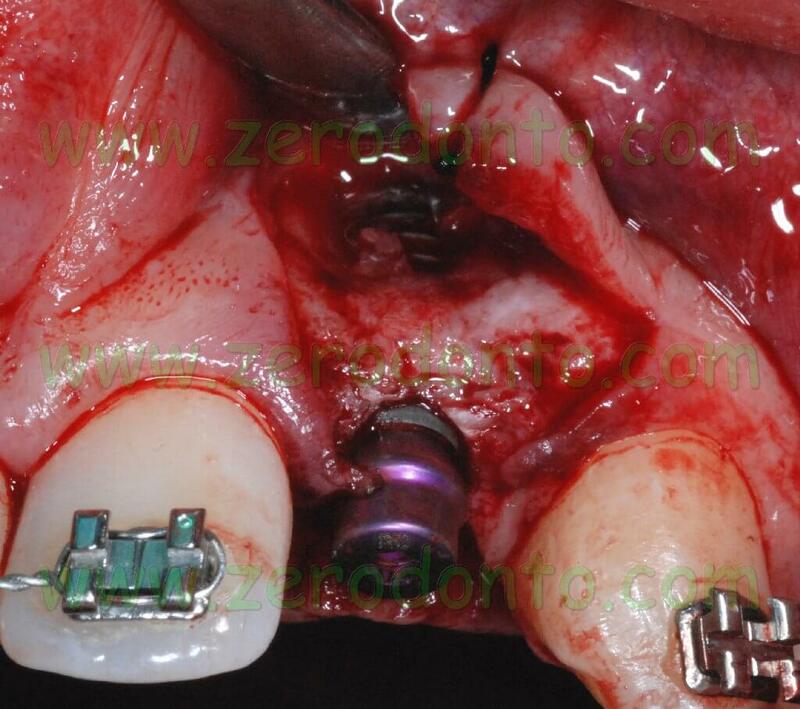 Nevertheless, the above described Bone Level implants improve the Straumann components and the availability of a submerged implant could be useful in specific clinical conditions. 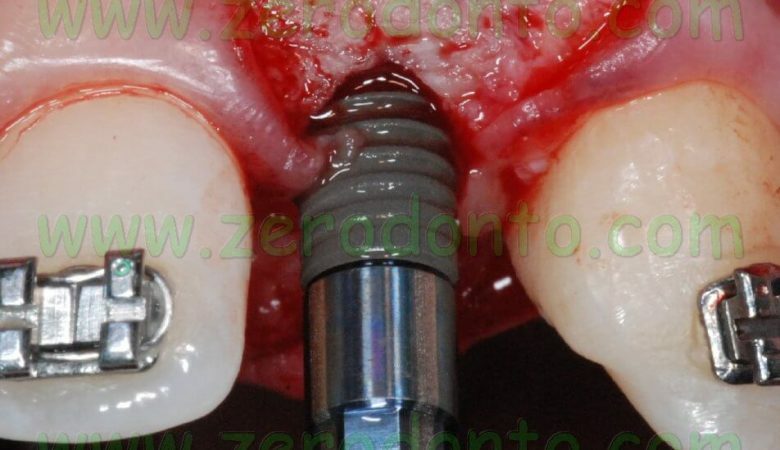 Furthermore, although it was not eliminated, the microgap at level of the bone was significantly reduced due to the conical adaptation of the components (Crossfit TM connection). 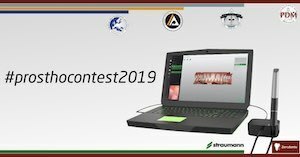 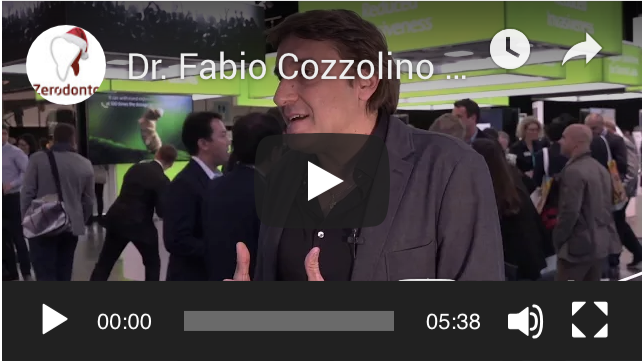 Finally, a clinical consideration: just like the “switch platform” of implants by Astra, Ankylos and 3i, the “Bone control design” by Straumann allows to reduce the cone-shaped bone resorption at the implant neck. 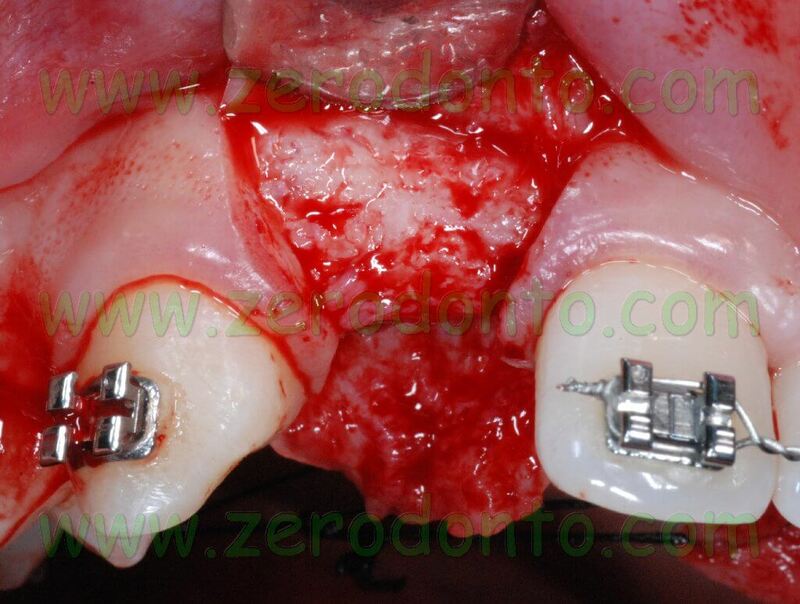 To date, no evidence based data are available regarding the influence of such geometry on plaque retention in case of periimplantitis, due to the formation of a pocket at level of this platform.